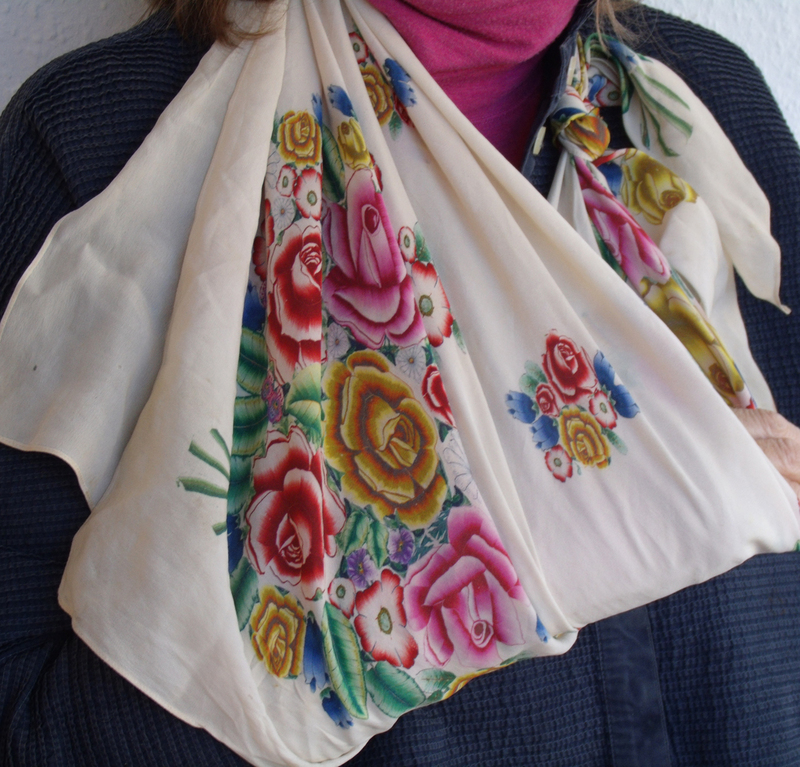 Sensing a dressing -up opportunity I got rid of the NHS white cotton sling as soon as I could – like the next day, and instructed my husband, Steve, to take pictures each morning of mt slings. 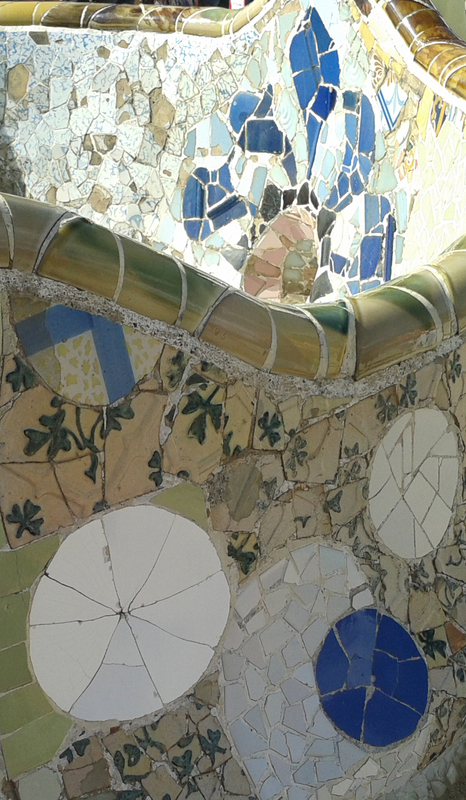 The commercial alternatives for the longer term support were in dreary colours – as if you wanted to hide the injured limb – I want everyone to see clearly my affliction and Keep Clear! So I determined to find alternatives from my stash of both vintage and modern scarves, let’s face it any excuse to dress up ! 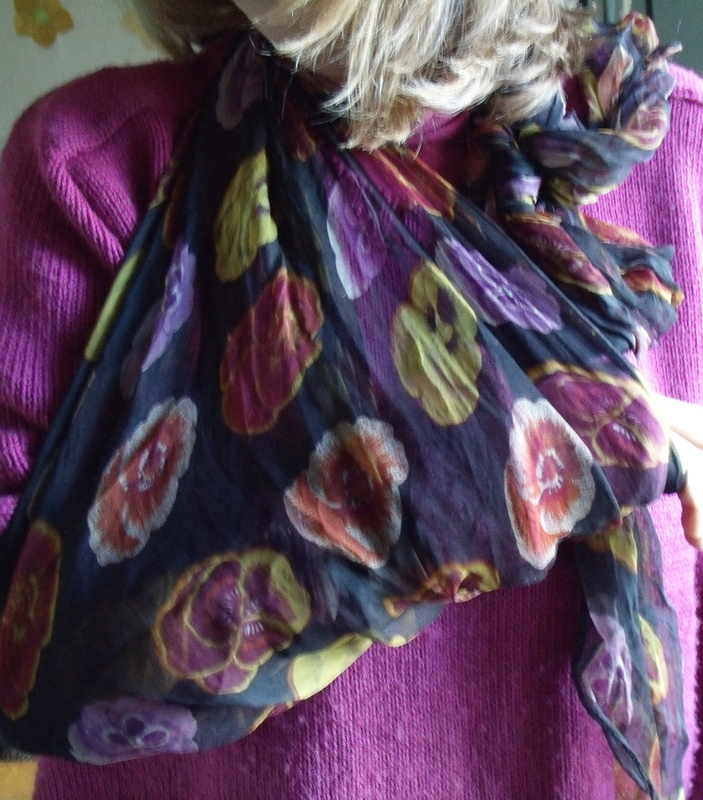 in fact I welcomed the opportunity to wear these old scarves, using them as slings affords much more are pattern to seen, tied around the neck only a small area is glimpsed if you have long hair. 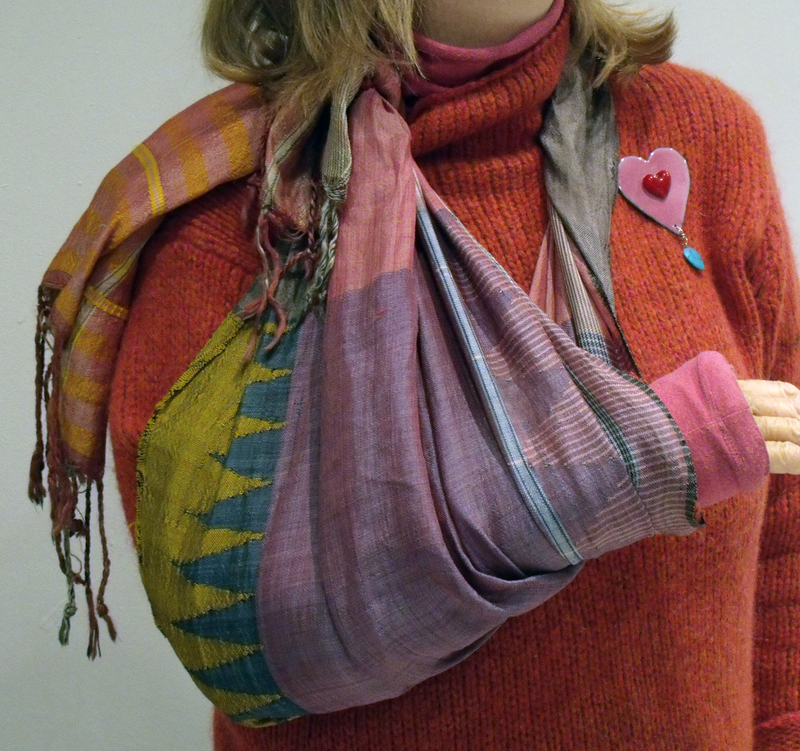 the really wide slings hide my new bright pink cast when it doesn’t tone with the clothes. I am especially pleased to be able to wear the original art deco head square, very dynamic and such unusual colours and pattern clash. 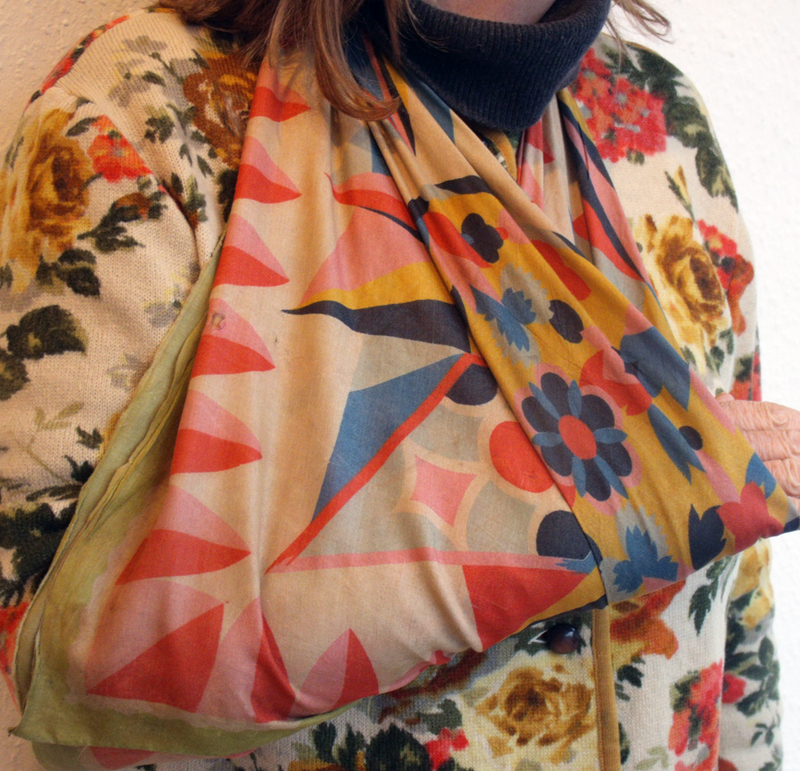 Categories: Make - Do and Mend | Tags: prints, scarves, slings, vintage | Permalink. 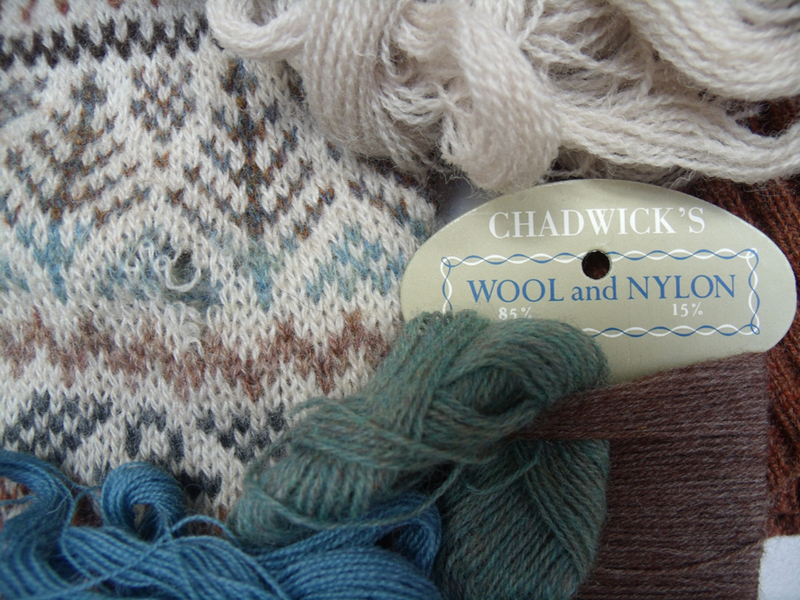 Knitwear – but not as you know it! 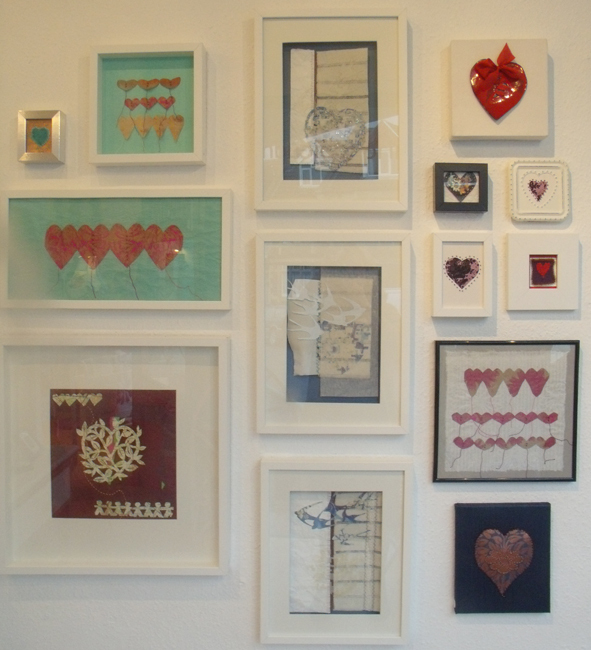 We have a wonderful new exhibition at Heart Space Studios. 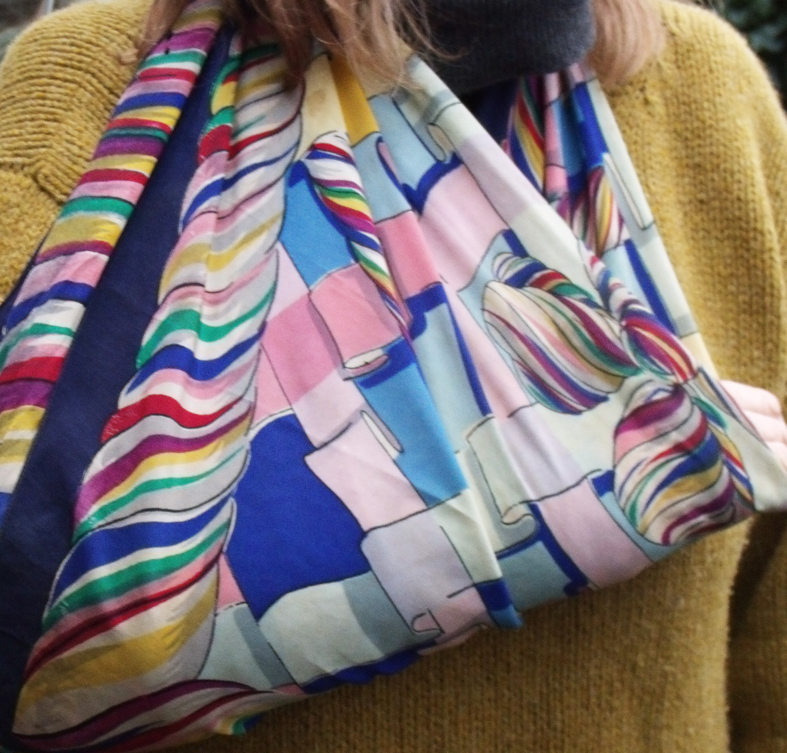 It is a collection by Stephanie Wooster ( who conducts unusual knit workshops with us) developed from her MA studies and it concerns itself with wrapping, tying and generally caressing the upper body. 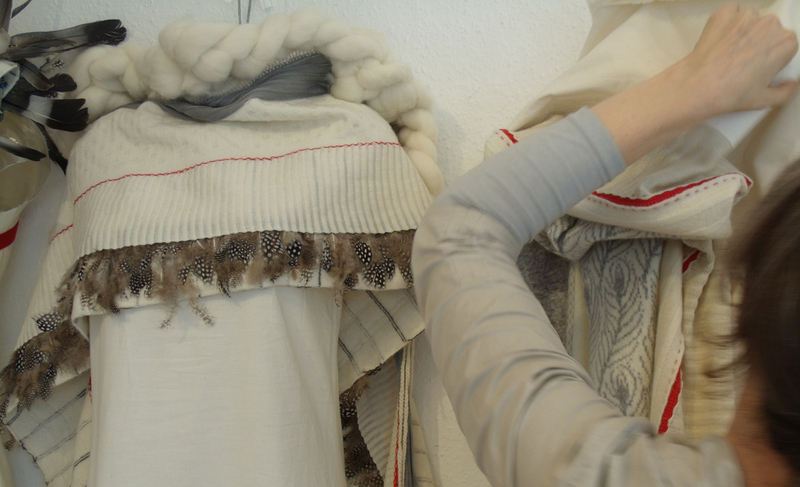 the names of the different pieces tell how they are perceived by the maker – Swaddle, Swathe, Shawl, Sheath, Mantle, Shroud. 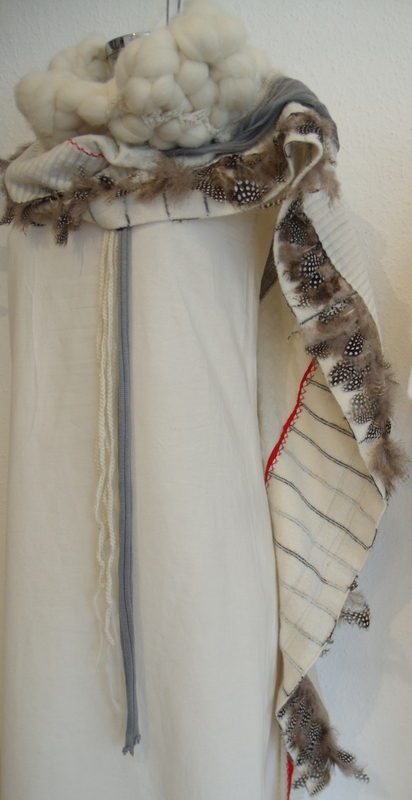 The work is embroidered, felted, machine knitted, plaited and patch-worked together, with feathers, braids and calico. It sets a calm but slightly surreal feeling to our small gallery space. 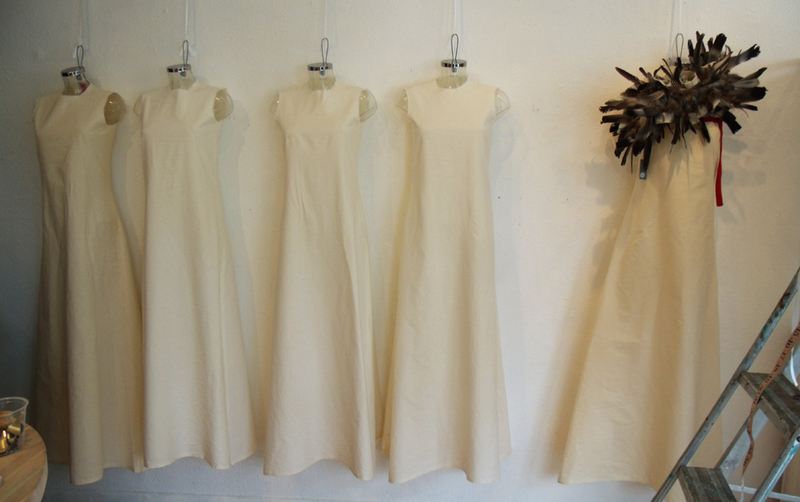 The first things brought in were a series of clear plastic torsos which were then dressed in simple calico shifts before being hung on the wall. The calico shifts or shrouds? 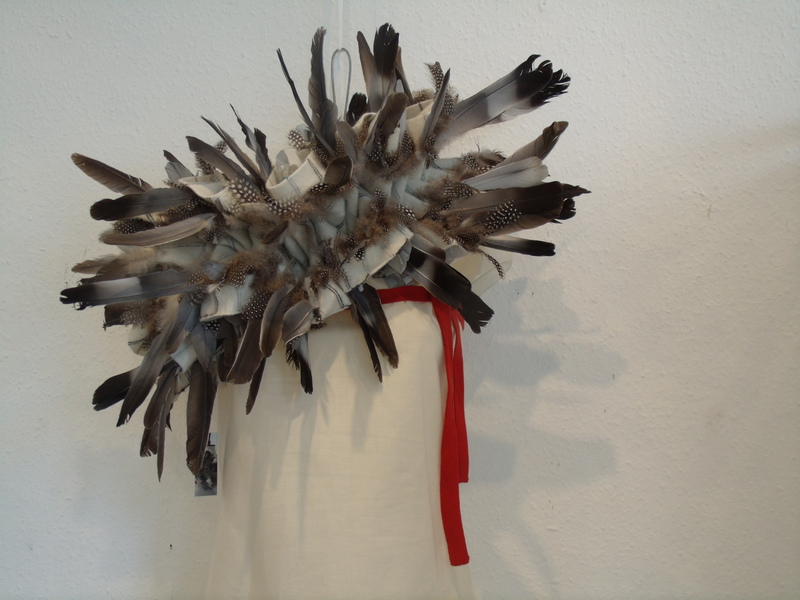 then Steph started to dress them up; first the dramatic feathered collar was placed to set the atmosphere…. 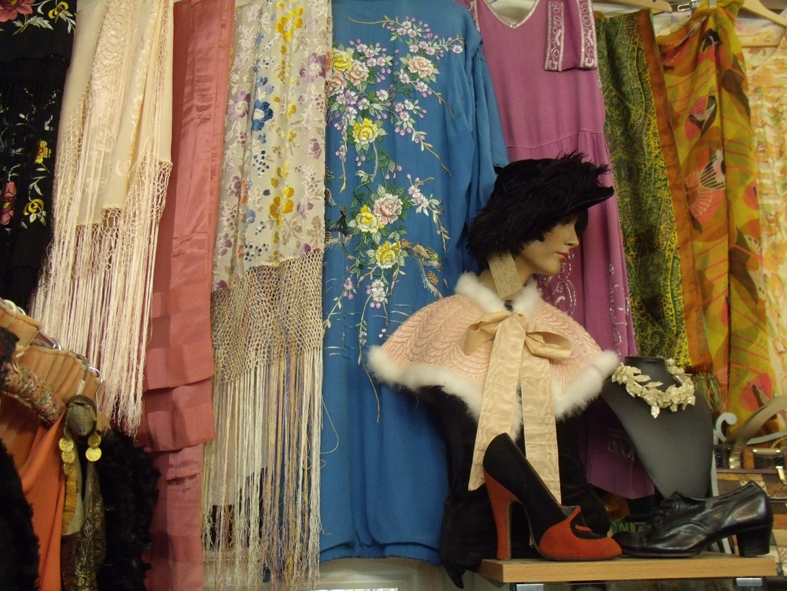 Then out came feathered scarves, stoles and wraps, hand knitted and coiled hanks of wool, even felted knitting with feathers as the motif…. 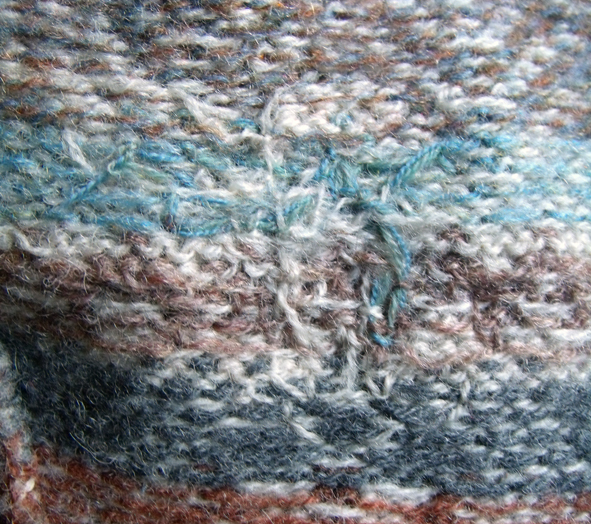 felted feather design on machine knitted wrap. 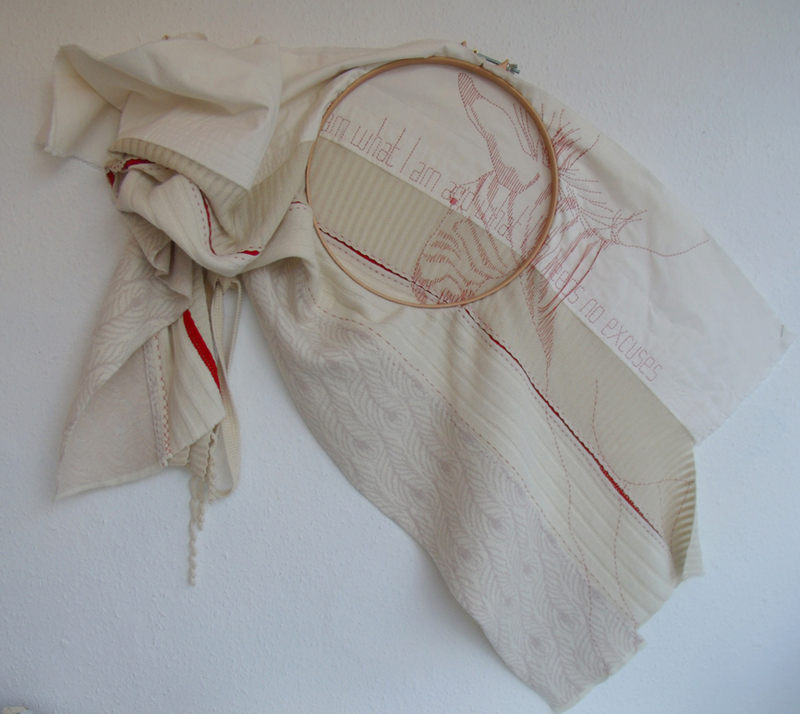 the large wraps, shawls or scarves, call them what you will – are made from several different textiles and hand stitched or even embroidered together often using a red knitted braid as a backing, this causes interesting lines to be drawn around the body when draped. 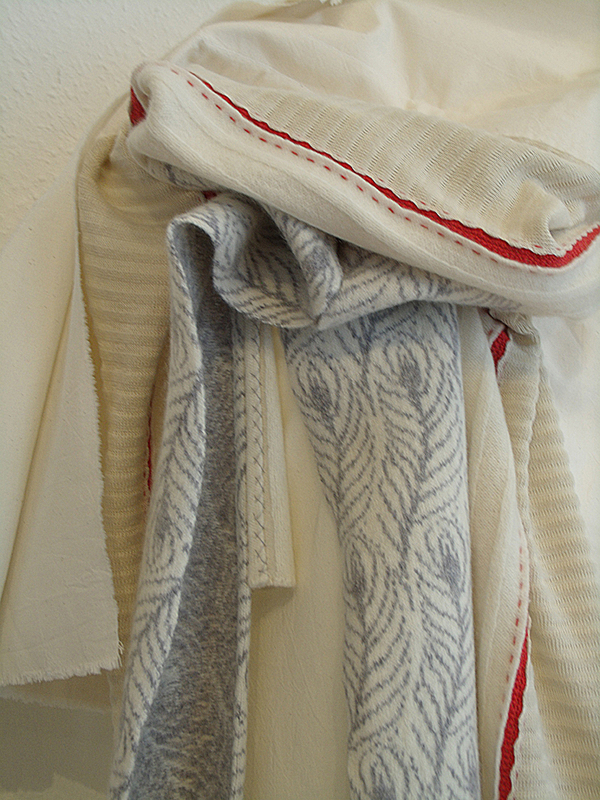 the row of 4 pieces are really powerful and entice people to study them up close and personal…viewers are not quite sure what they are seeing, are these felted woven blankets, some unusual woolen ticking or simple striped knitting? row of 4 pieces awaiting the extra exhibits. 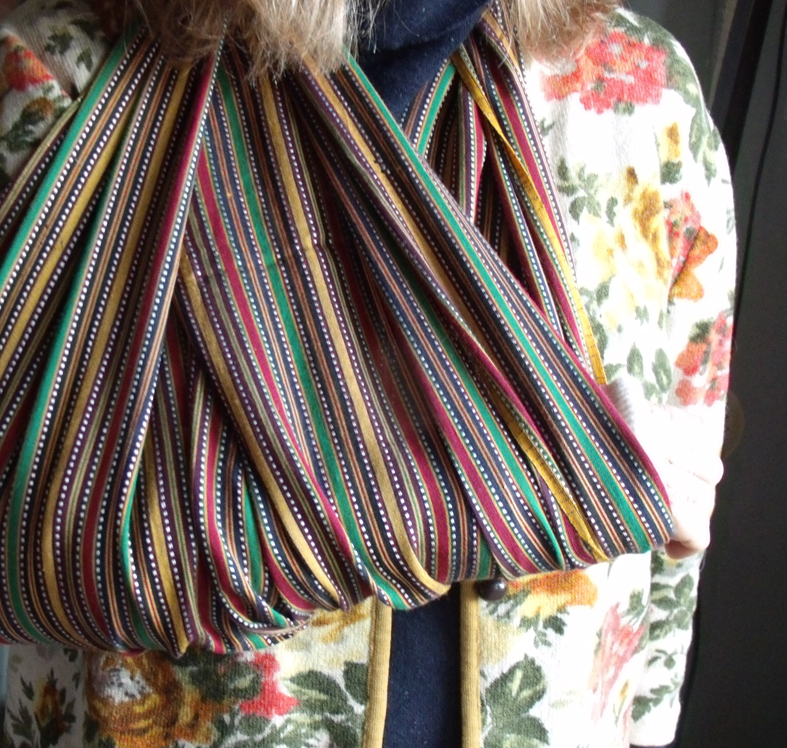 When this group were placed Steph brought out a whole range of very finely machine knitted lengths in different colours and combinations, these can to worn any which way – I like them draped around the neck as an elegant sort of knitted necklace. 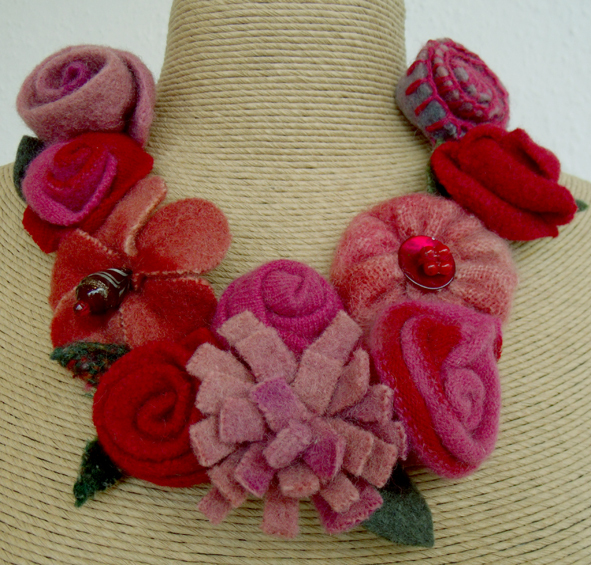 wall of fine knitted necklaces in brilliant colours and pattern combinations. 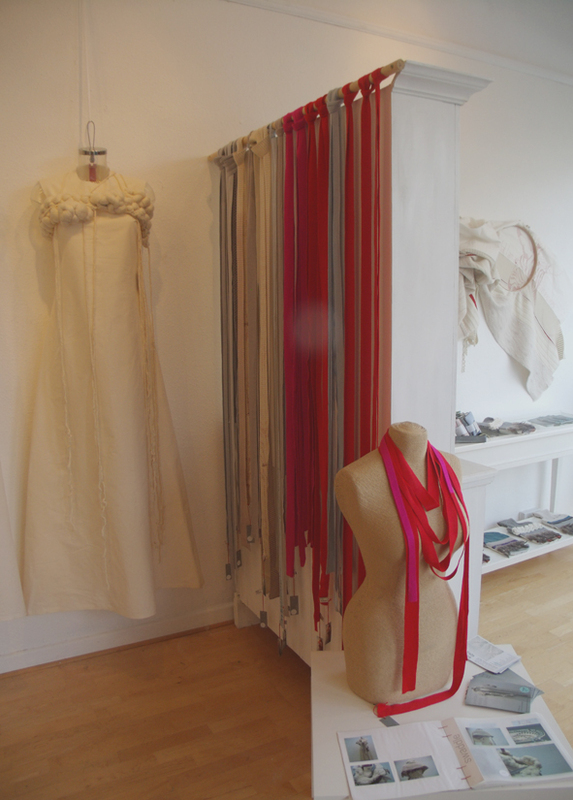 We like to have exhibitions of selling stuff at Heart Space, and most of these pieces are for sale, but Steph also brought a selection of beautifully refined knitted ribbons, that are carefully joined at the back so that they always behave well when draped! 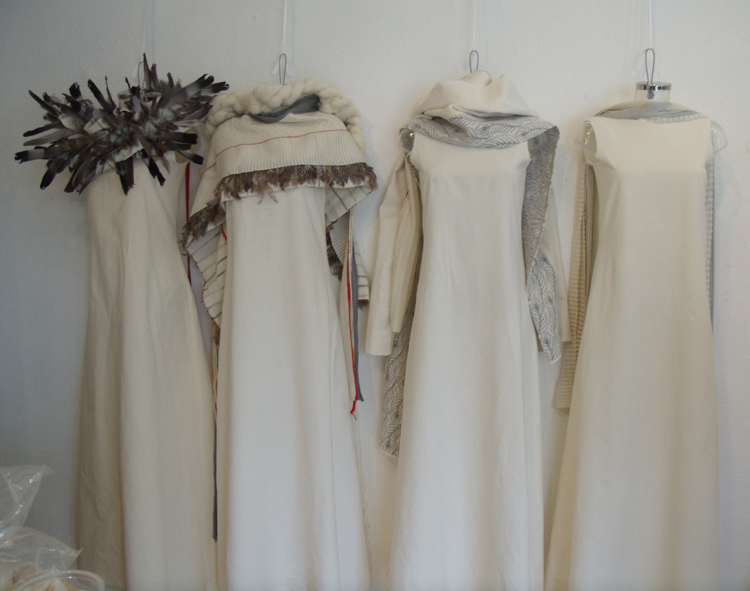 This is what I like to have for sale in the studios, exciting but wearable pieces with an edge, not fashion but style! 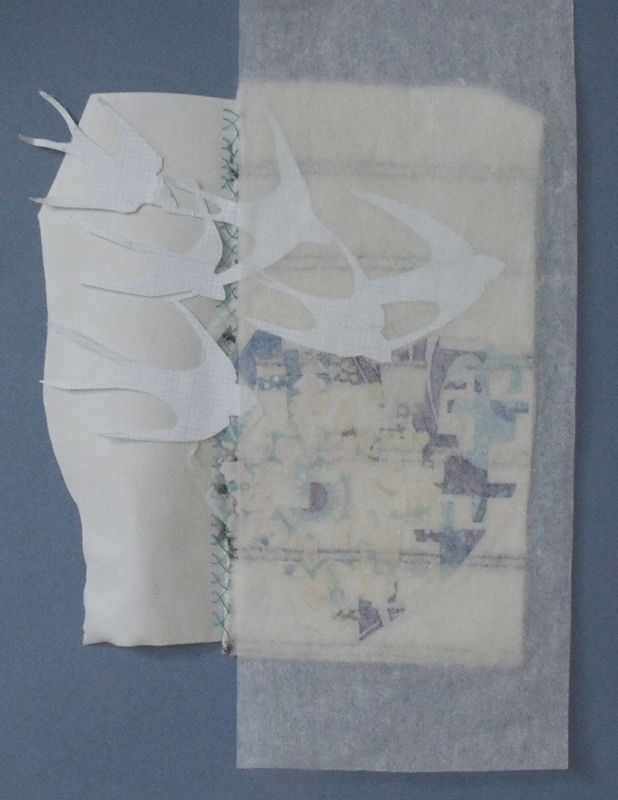 this was made for another exhibition and shown earlier in the year , Mending at the Museum, it was really good to see it again with these earlier pieces and interesting to see how new work develops out of completely different stimuli. 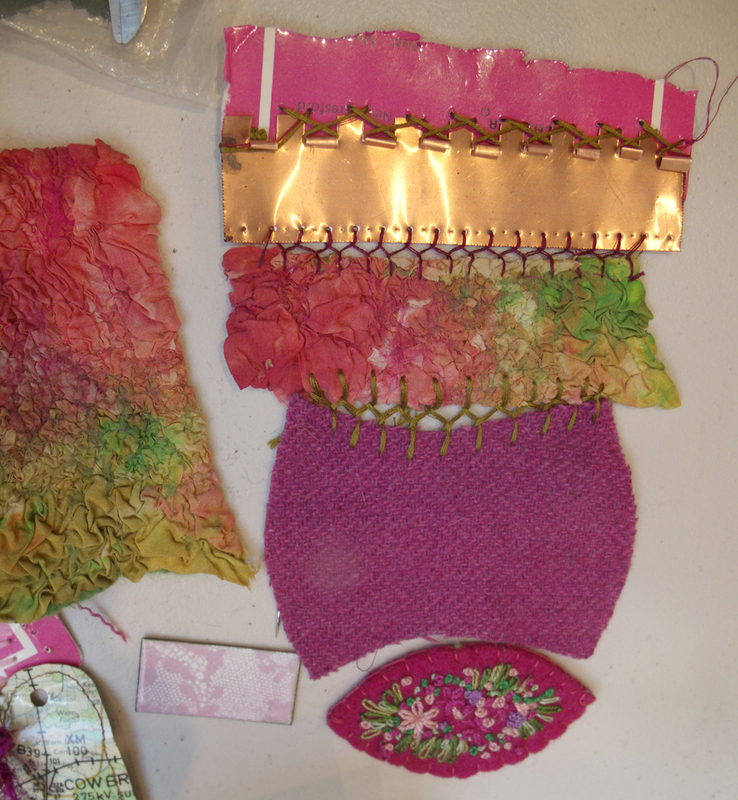 Steph has also made a series of mixed media hot water bottle covers, developed from her samples at the Heart Space Mixed Media workshop earlier in the year, with more of her hand warmers( it is Autumn after all) and these have specially colour co-ordinated to the exhibition. 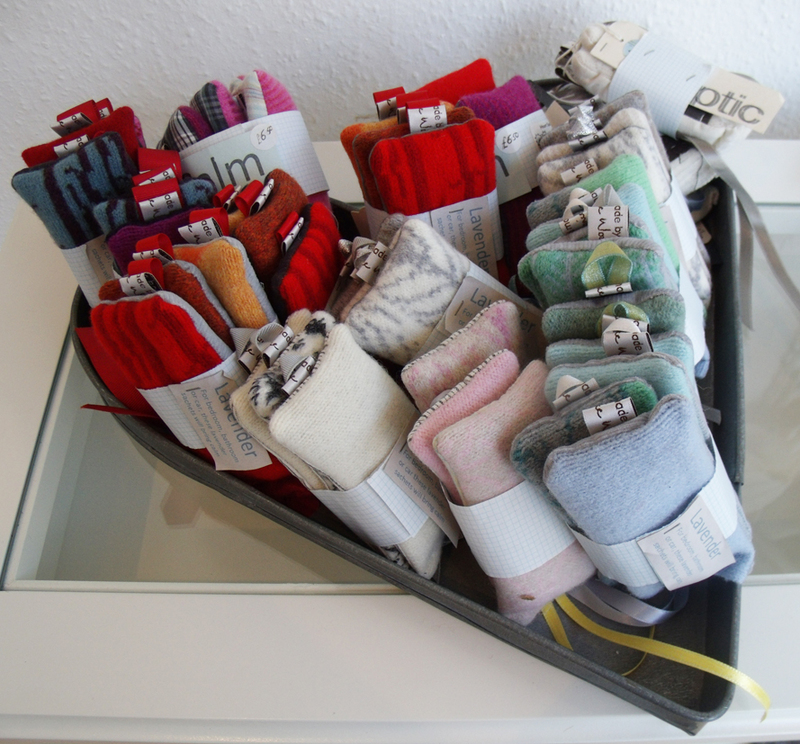 colour-co-ordinated hand warmers – heat them first in the microwave! 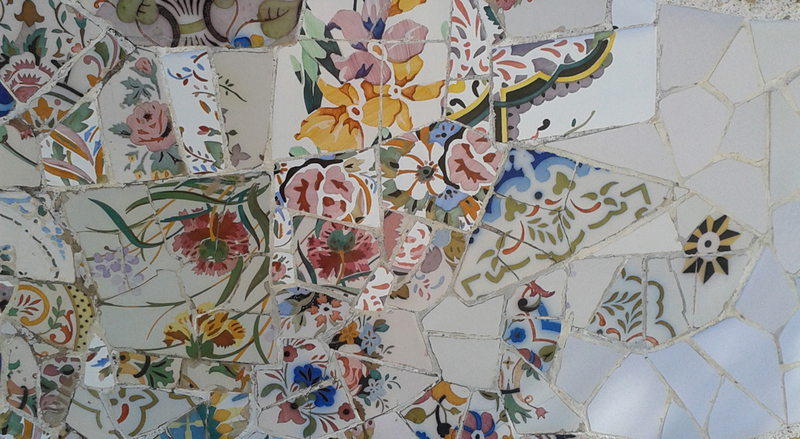 This is what intrigues me about many successful textile makers and designers, they can develop many different types of work, from applied art pieces for museum exhibitions, to practical hand crafted things for everyday use. This is the way many of us manage to make our living while finding time and energy to research and develop our own personal work. In fact without the research and development of private passions many new and commercial designs would never see the light of day. 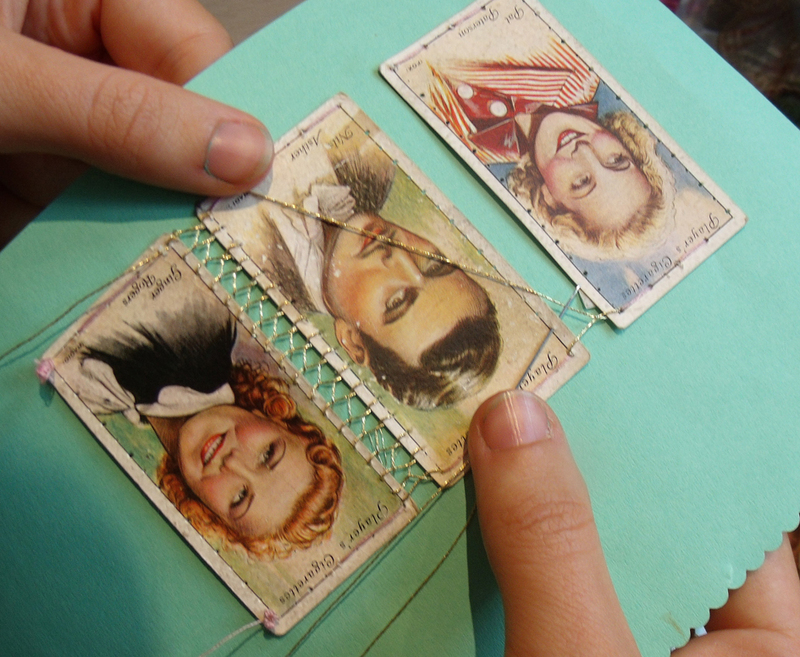 work book showing stages of making as well as research inspiration for the collection. 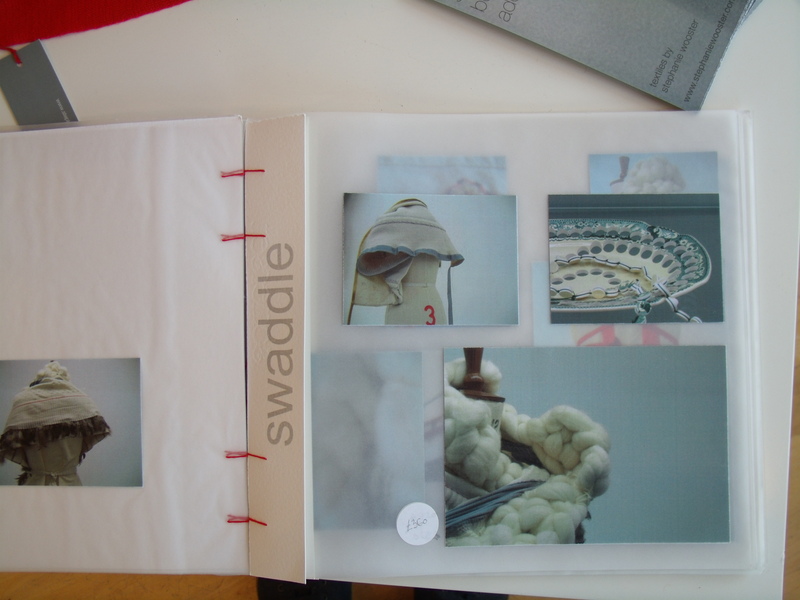 Looking through this book lets us see how Steph links all sorts of unusual images and ideas and then literally knits them together to make new and exciting wearable textiles. 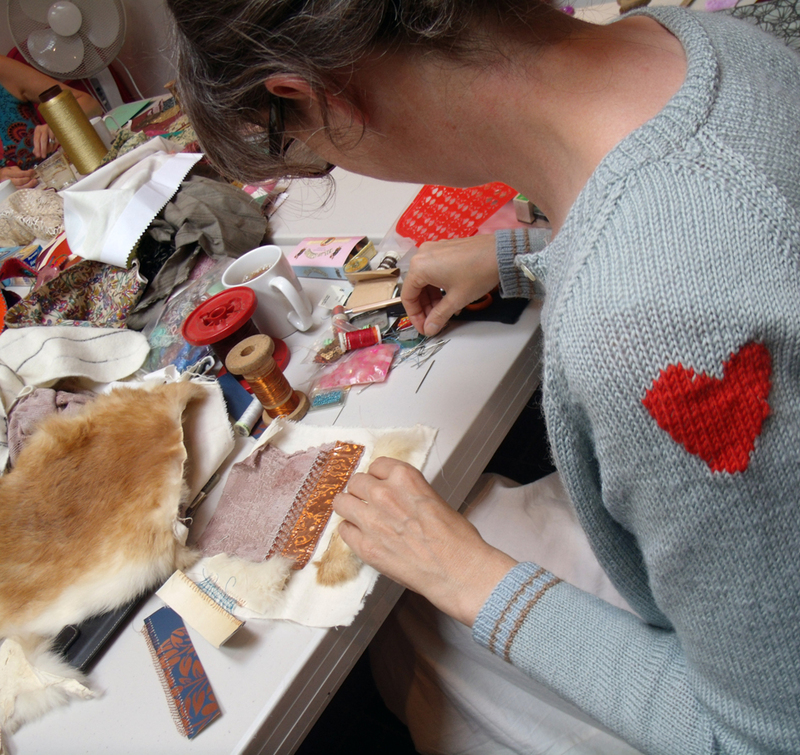 Categories: Heart Space Studios, Make - Do and Mend | Tags: embroidered knitting, feathers, knit, wearable art. 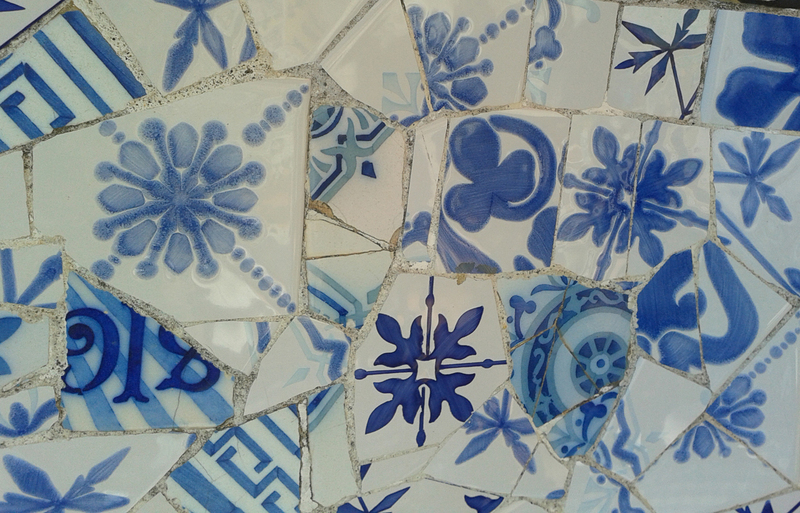 mending. | Permalink. 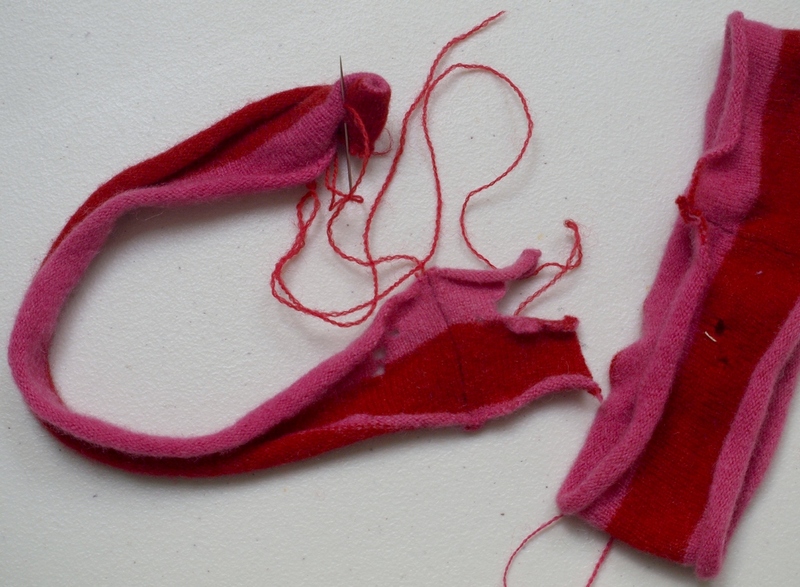 my totally moth eaten cashmere cardigan – but with darning still intact! This is a sad story with a happy ending. 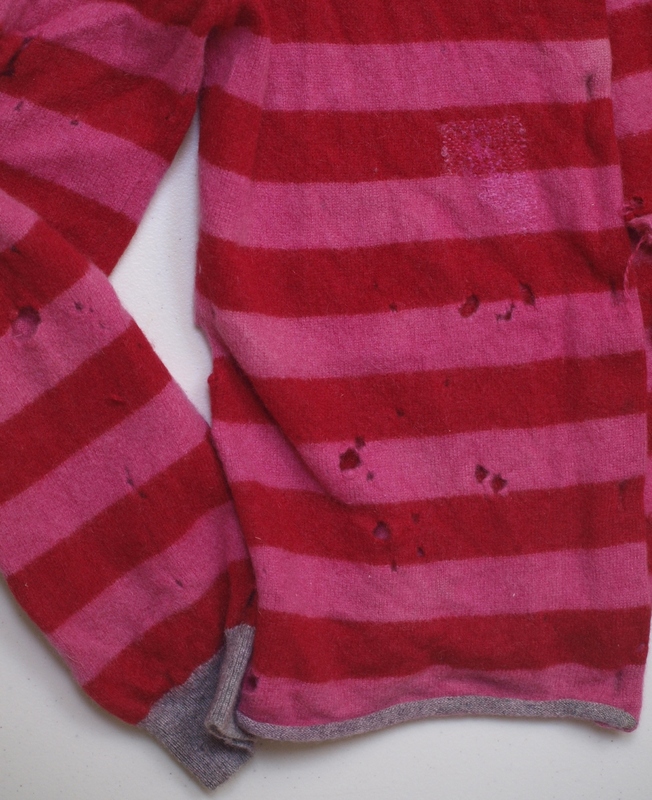 My favourite cardigan that was included in my first ever post, Make Do and Mend, where I proudly showed the careful darning that I wore with pride, sadly, got lost. When I eventually found it pushed to the bottom of my laundry basket (don’t ask) it was totally ruined even beyond my restorative darning powers. I decided to felt it by boiling it twice. 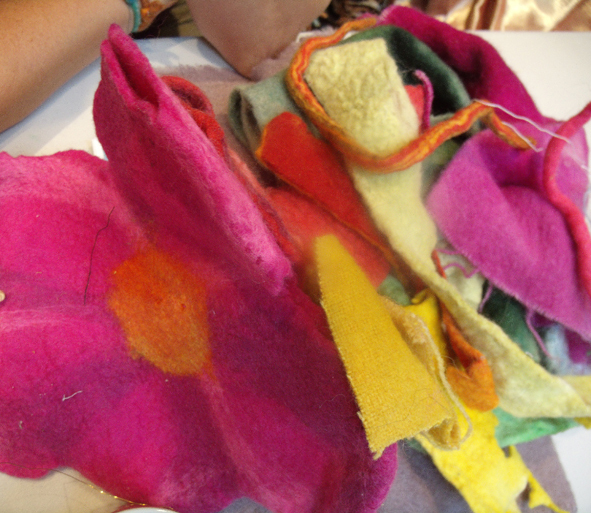 The colours are so vibrant that I just had to try to find a use for it and I found the perfect solution when designing with some lovely felted woolen blanket flowers that Kirsten Hill-Nixon had brought along as a new idea for a class at Heart Space Studios. 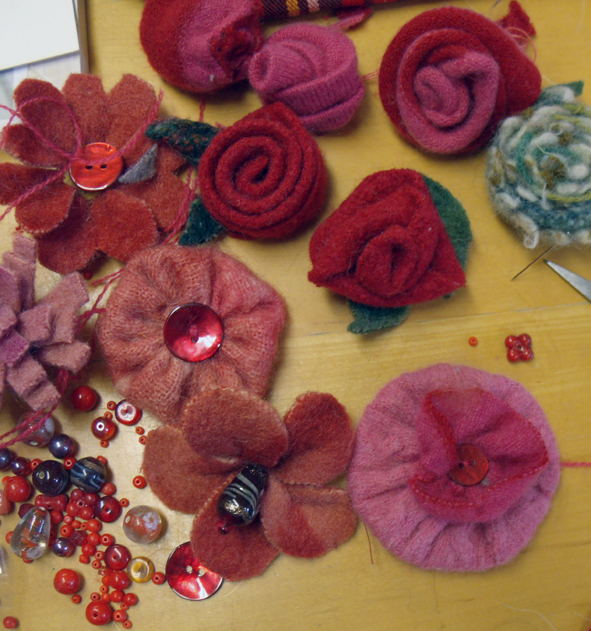 the reds and pink selection- I really like the tartan rose. 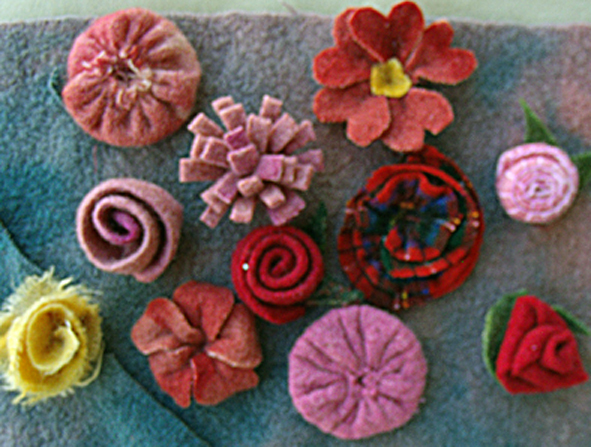 Kirsten will make the flowers in the morning class and I will develop the design and make session with them in the afternoon…but first I had to design something with what she had brought me, and she had brought me a whole selection of disparate flower heads – just as I has asked her to. I made 2 colour sets of flowers. 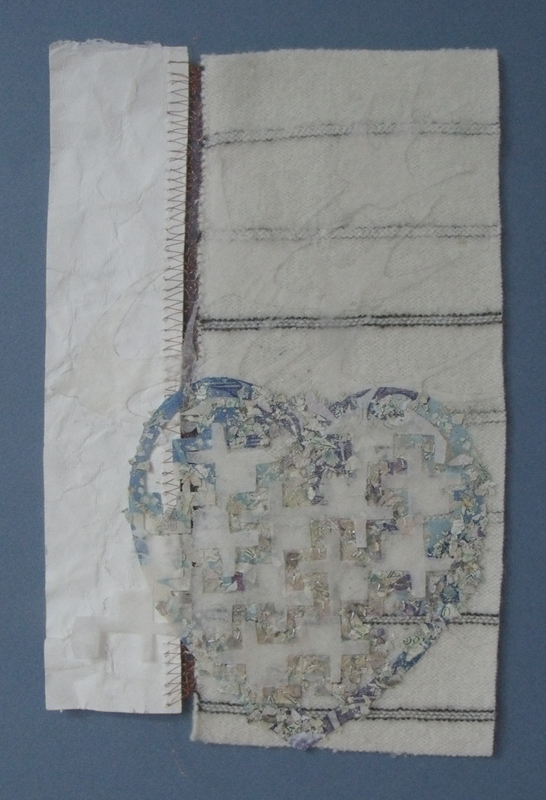 the neutrals were really soft and wooly, very tactile and I thought first to just make a heart out of them – well I would wouldn’t I? 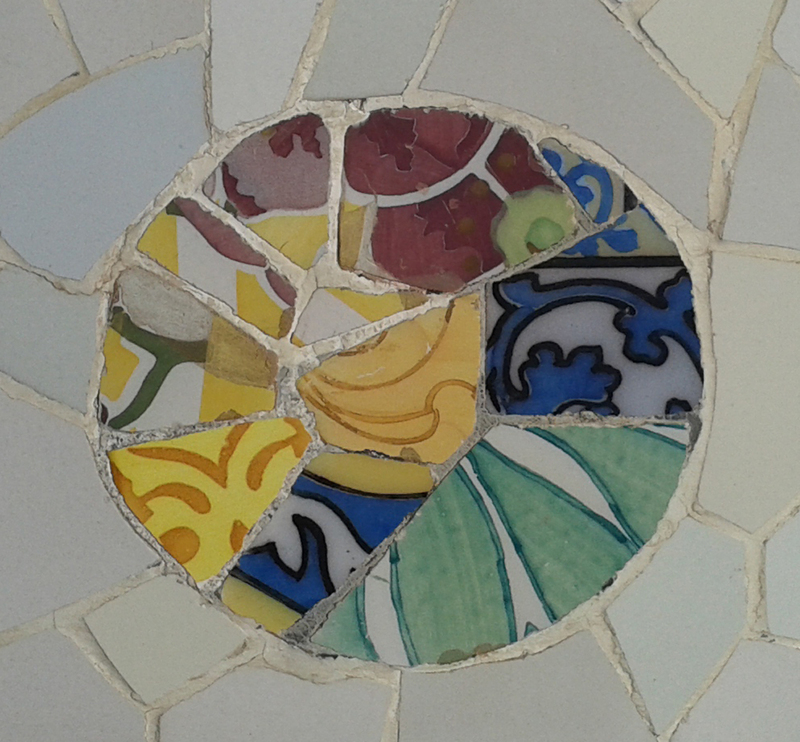 and in fact this is a really nice idea I may go back to….. 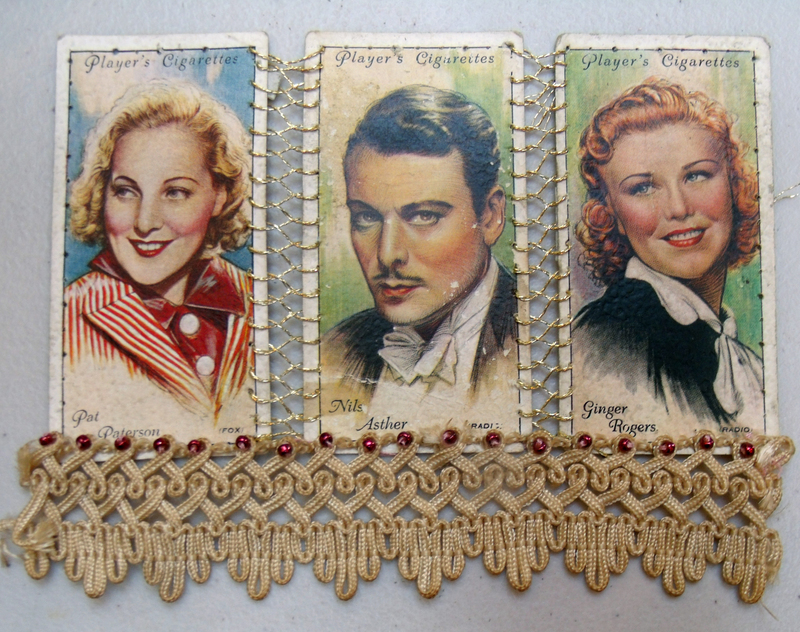 But then I imagined them as adorning a woolly winter jumper or cardigan, they aren’t heavy but they are bulky and a brooch seemed better than stitching them to a piece of clothing. 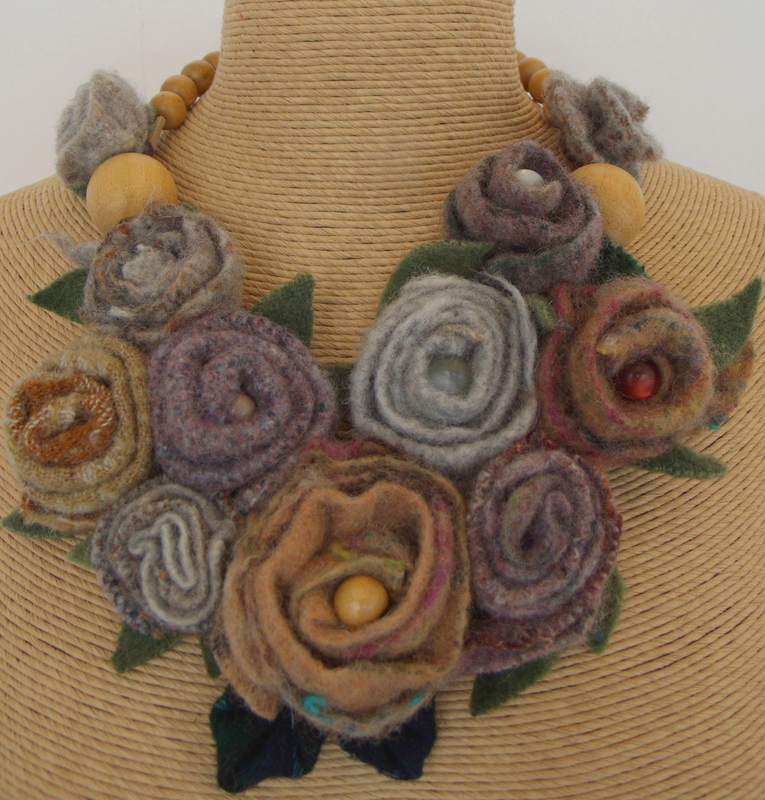 But I had been given so many flowers that I soon decided on a necklace…. 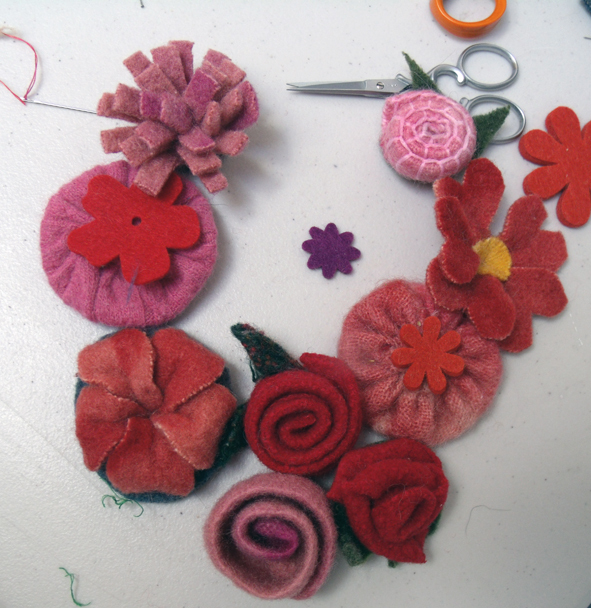 I set to work but when stitching them together without a backing fabric, soon realized that I needed just a few more roses….then I remembered my old ruined cardigan. 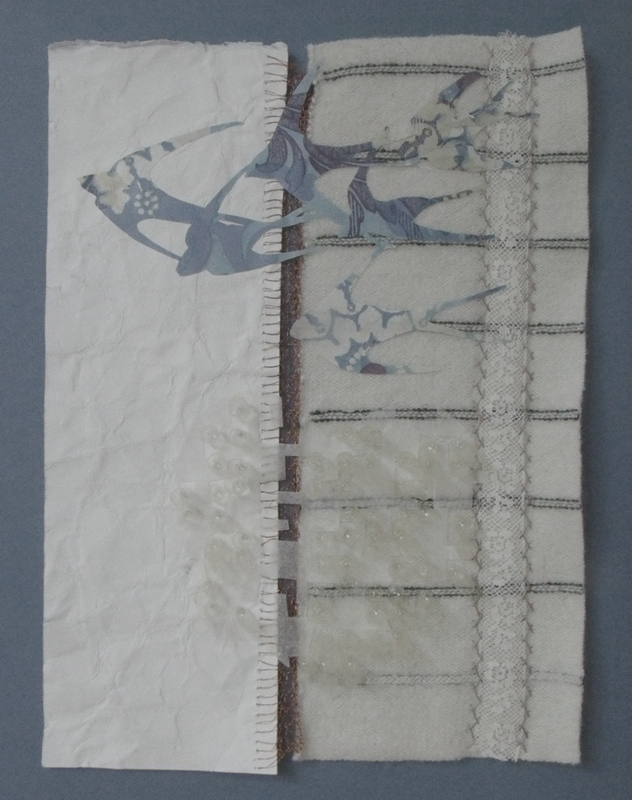 I cut the sleeves into ribbons of different coloured stripes and stared to stitch the rose buds by simply rolling and folding the strips to suggest overlapping rose petals. 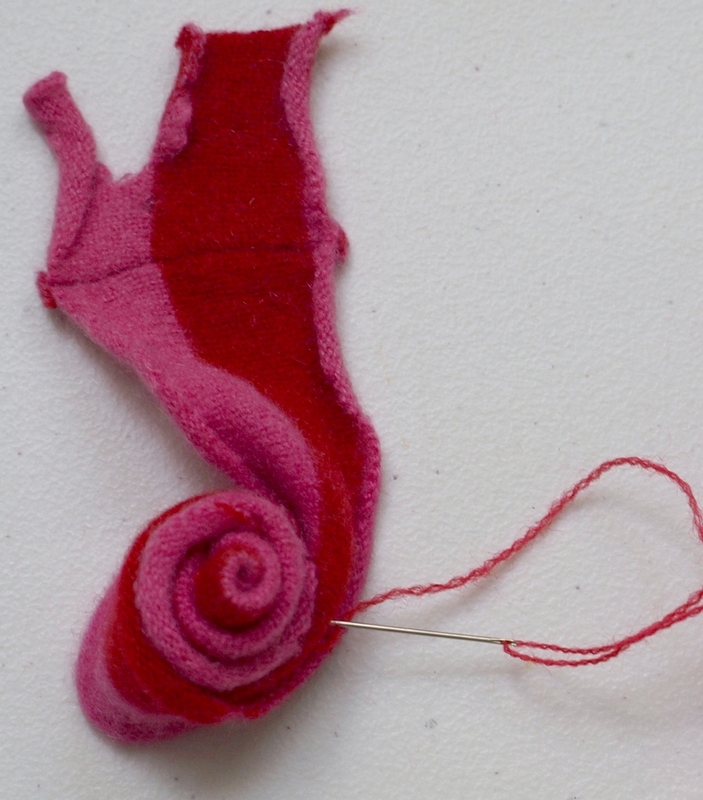 I had used this system many times as it is so easy – you just need to stitch as you go and control the folded edge, I found the way to do it in a vintage dressmaking manual from the 1930’s; the natural affinity to roll for cut knitting really helps the rose petal effect. 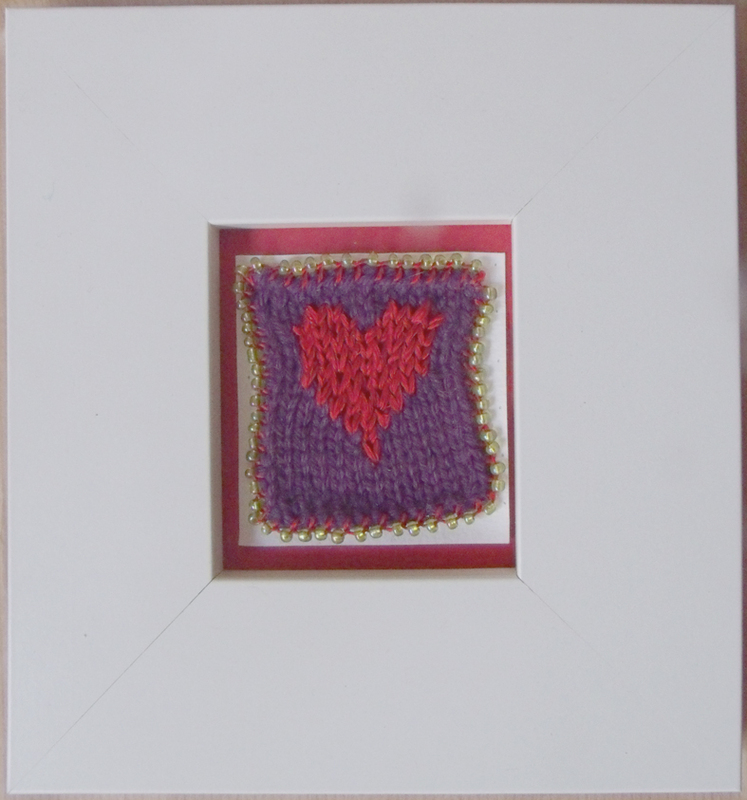 I was starting to see a new life for all my old felted woolens. 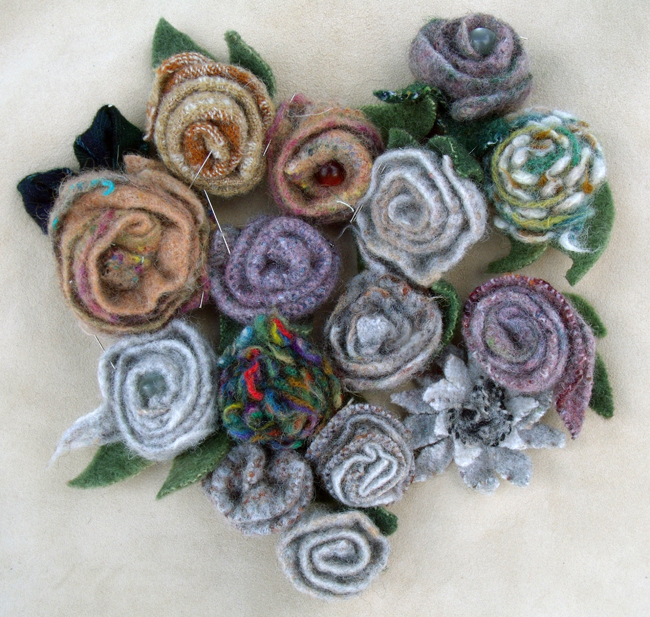 I inserted my knitted roses between Kirsten’s more substantial felt blanket ones, ( I really like her use of the blanket stitched edge for a fat rolled rose). She had provided leaves as well so they helped make the reds even stronger. 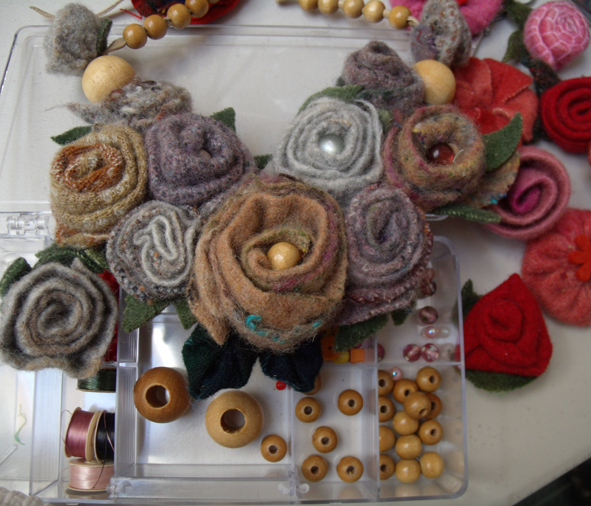 Then I simply stitched 2 suede strips for ties onto the last roses and there it is – now for the neutral necklace. the neutral necklace made of different blankets and added wooden beads. 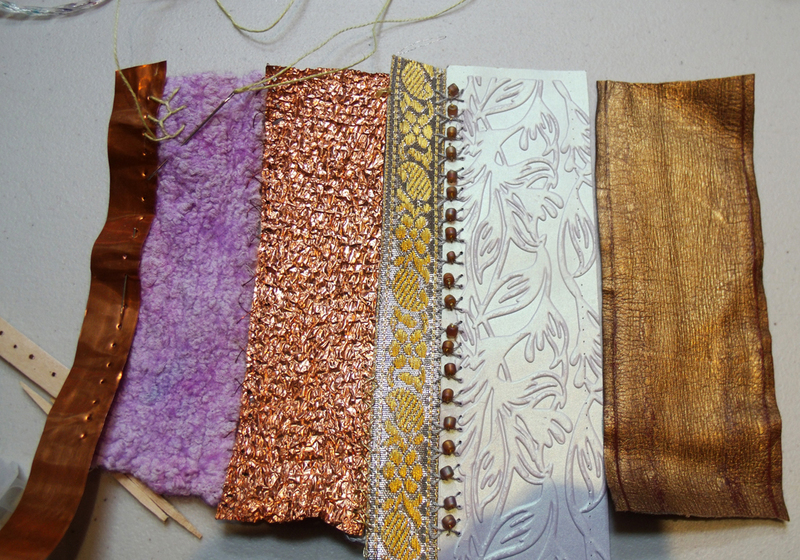 this time I added wooden beads by threading them onto the leather strips to make a more decorative finish. 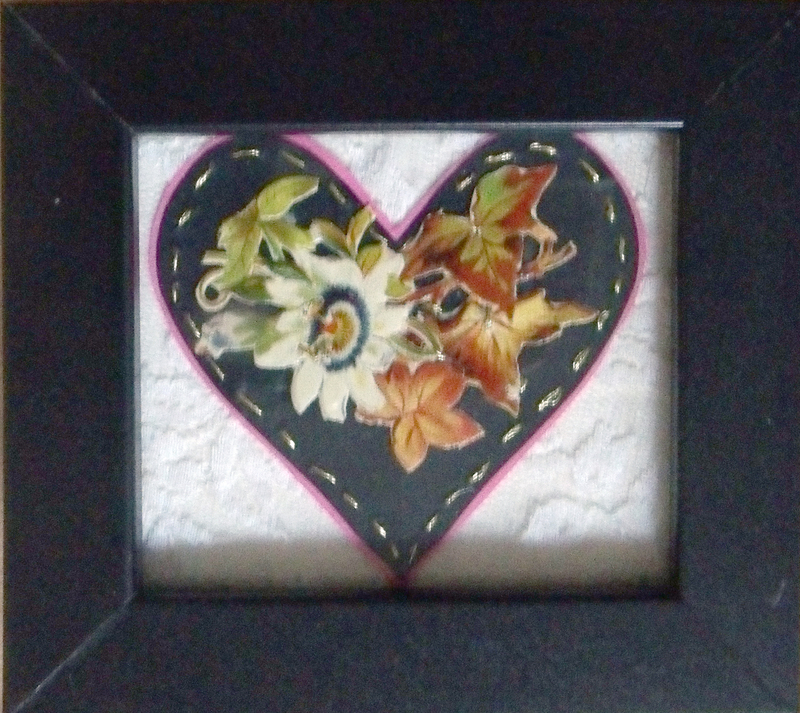 Kirsten had filled some of the centres of the flowers with soft glowing beads so I added some wooden ones as well, the soft tones and texture of the wood feels just right for this sort of fabric. 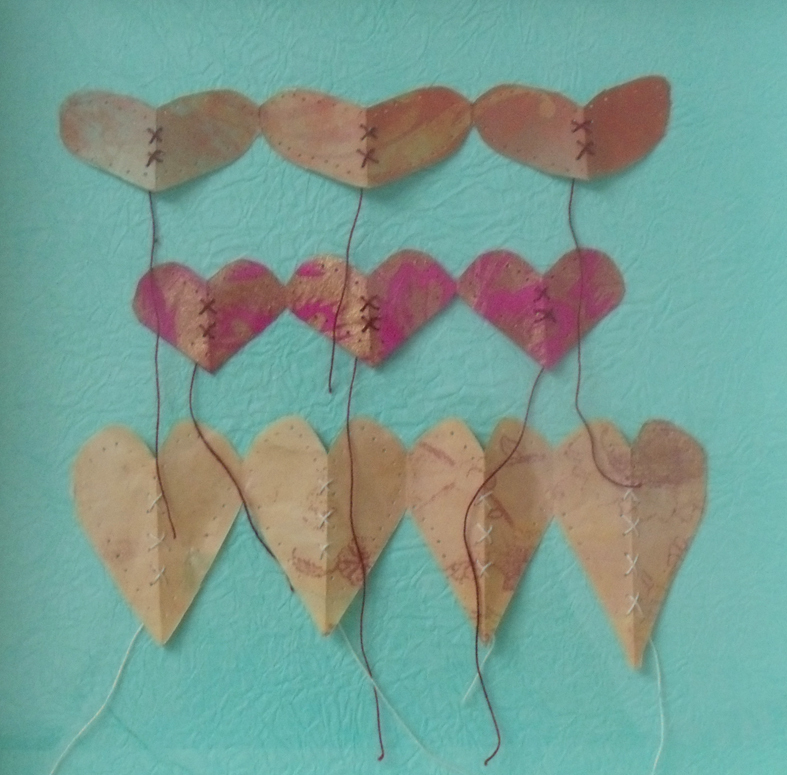 Categories: Heart Space Studios, Make - Do and Mend, Stitching | Tags: colour co-ordination, fleted flowers, make do and mend, ribbon flowers, textile jewellry, up-cyling | Permalink. 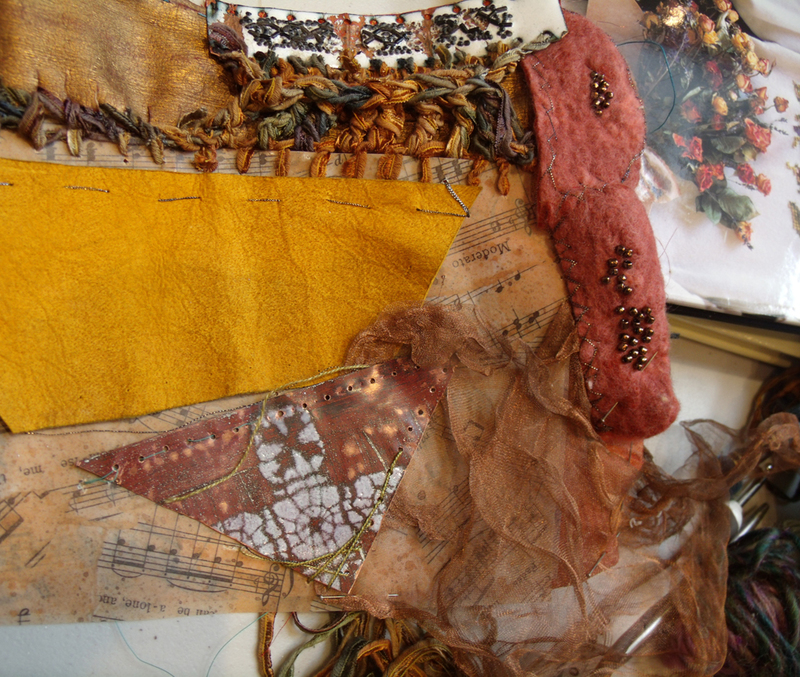 I am interested in developing a set of workshop using mixed media at Heart Space, think leathers, metals, ceramics, fabrics, glass and wood….. so I thought I could try the idea out on the people who work with us, all expert in their own field and up for a challenge. 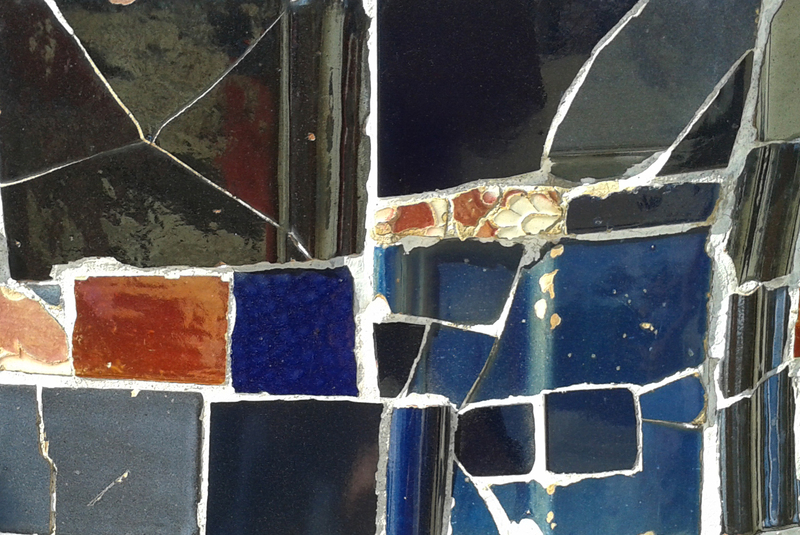 And as Crazy Patchwork samplers have been such a success at Heart Space Studios that I decided to run an Away Day for the tutors and staff to enjoy time making together. 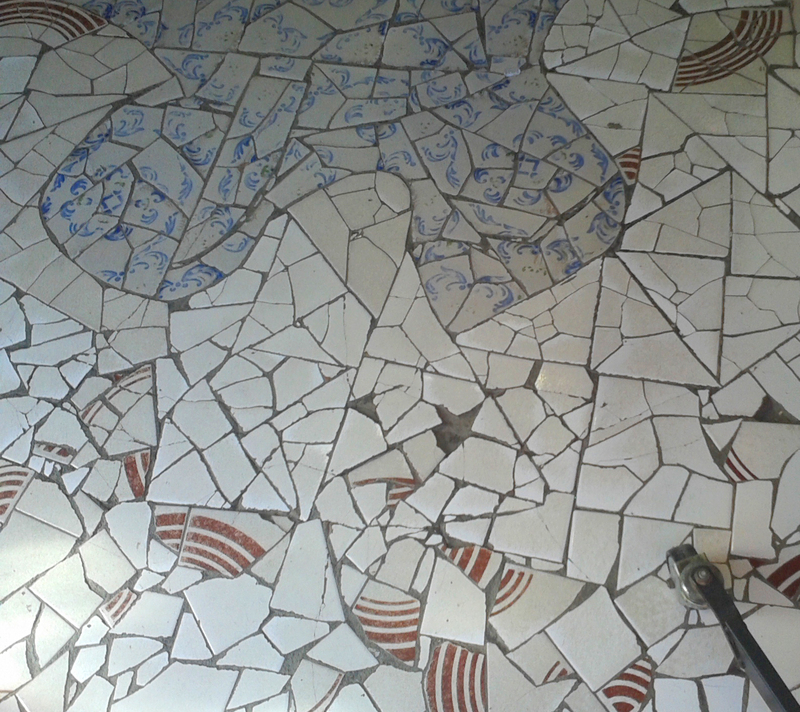 I asked everyone who could attend, to bring their own favourite materials and their tools. 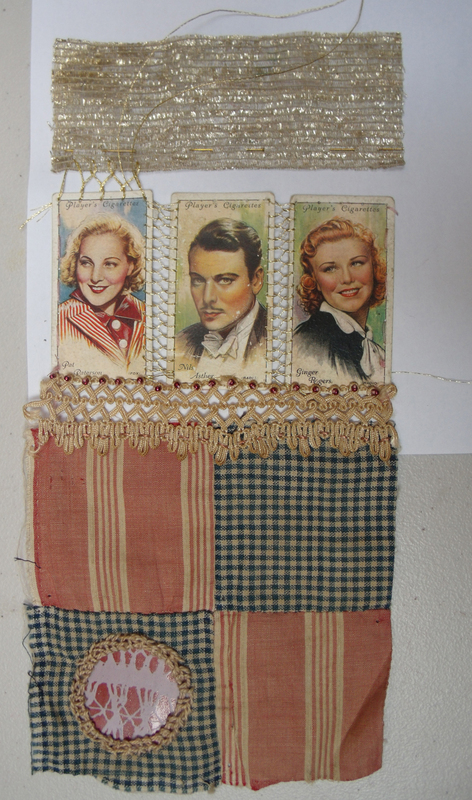 Each person would make either a strip sampler or a crazy square sampler by using decorative embroidery stitches to join the materials together. Most people brought their own stuff to share between the group, I am always impressed by the generosity of makers in workshops like this. 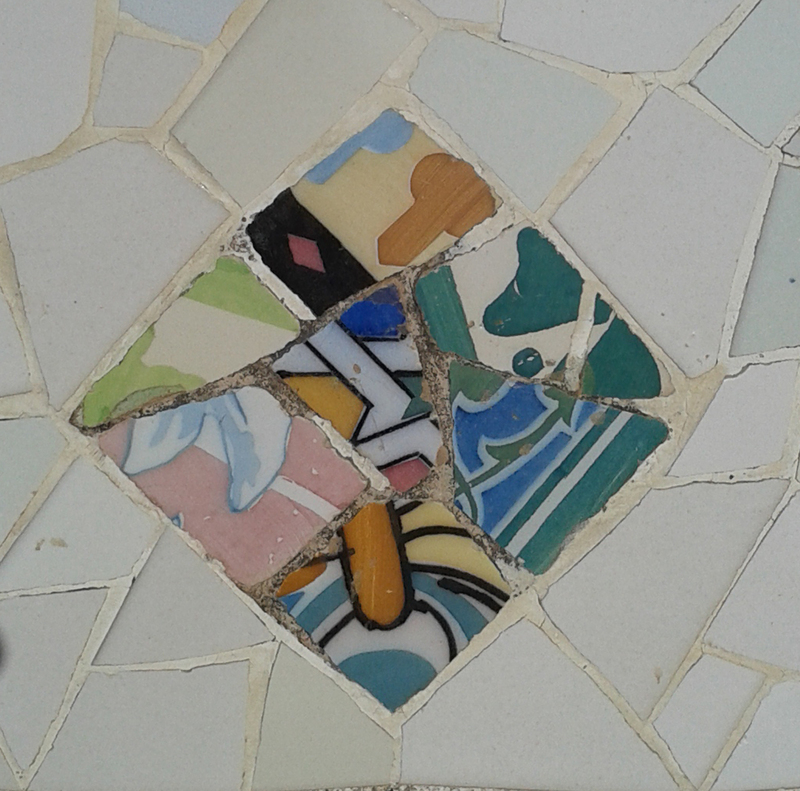 The group dynamic is encouraged so that people really want to help one another. 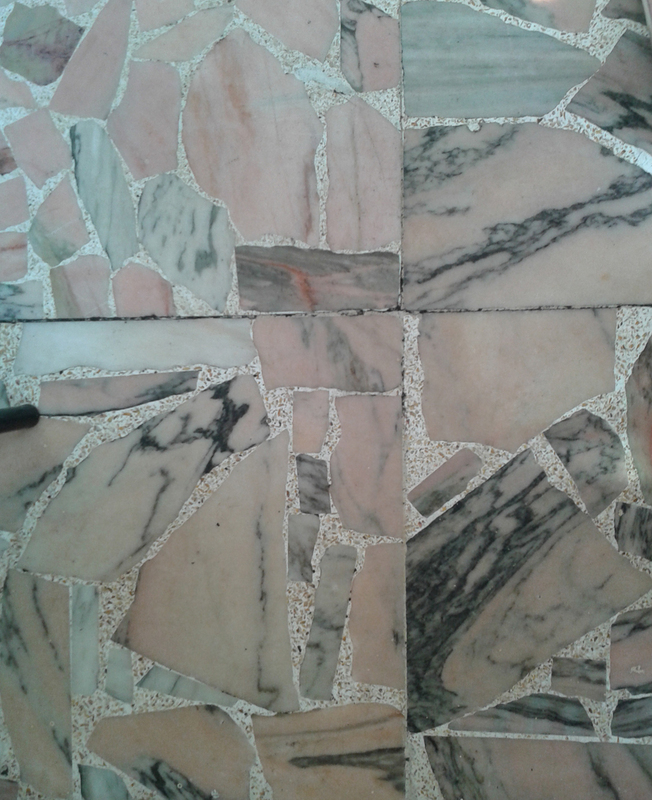 What is also an added bonus is finding a shared love of a particular technique or material, even makers of different ages and styles come together when they find they both appreciate a particular aspect of their chosen discipline. 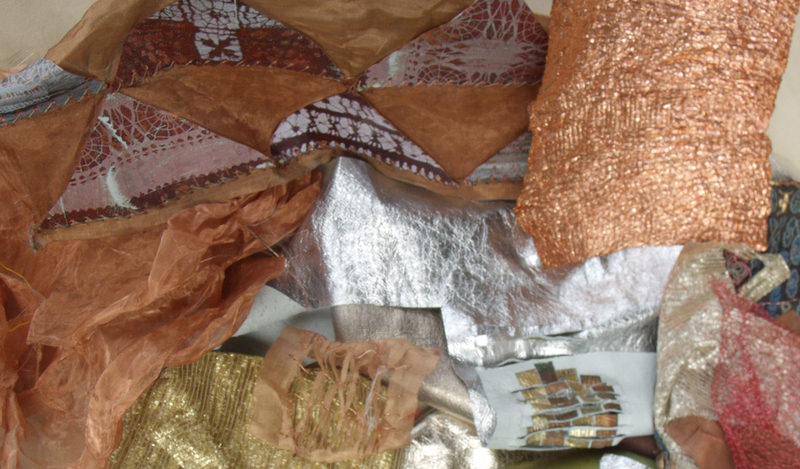 I also brought a large selection of materials from my home-based studios, all kinds of things: woven metal fabrics, stencilled enamels on copper, leathers, plastic lace, metallic damasks and other fabrics – and also the tools to drill stitch and manipulate them. 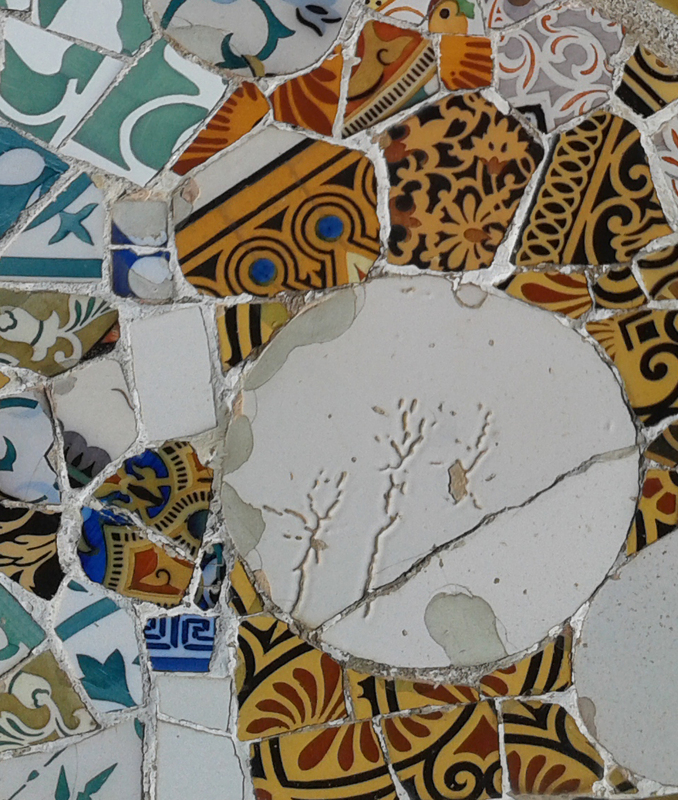 one of the best things about attending any materials based workshop is the abundance of new and unusual stuff that is introduced by people who are experienced in working with it – this can save days of researching. 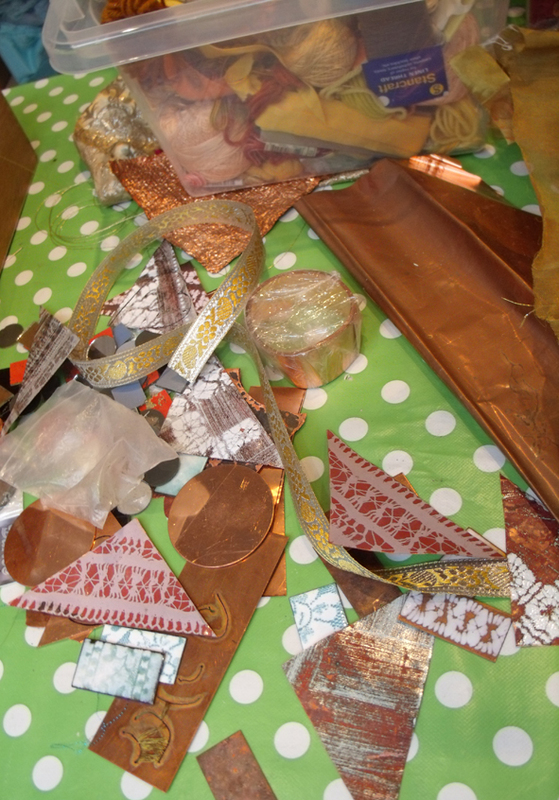 copper and aluminium wires for working with in any way possible. 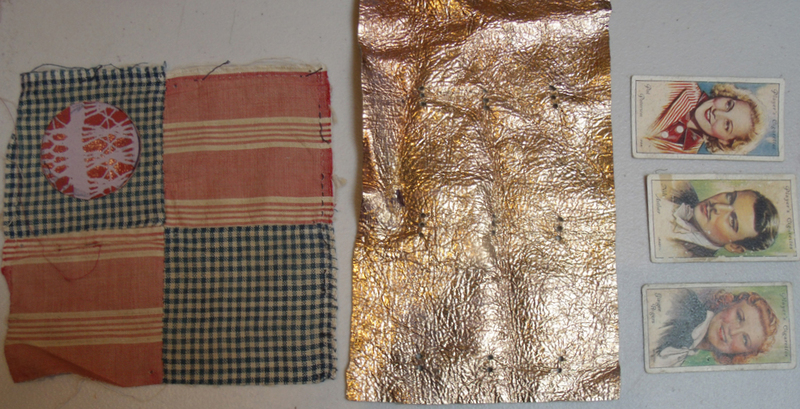 I particularly like metallic leathers and fabrics, so I brought lots of these in for everyone to sample, as well as scraps of thin copper, some patterned with vitreous enamel. 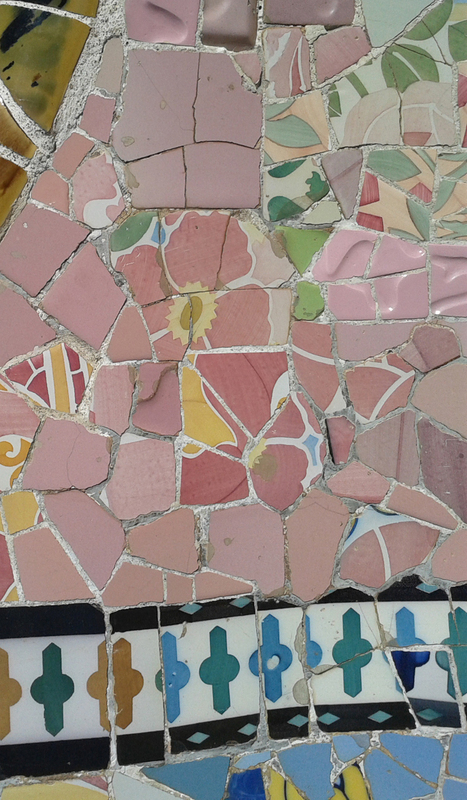 such a shame I had no time to experiment with the other tutors’ materials for this research session. 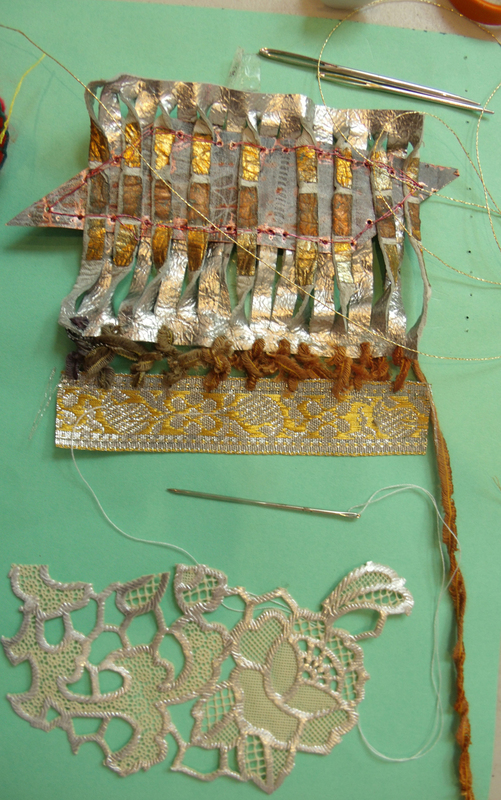 metal meshes and pressed copper foil, enamel applique and metallic leathers. 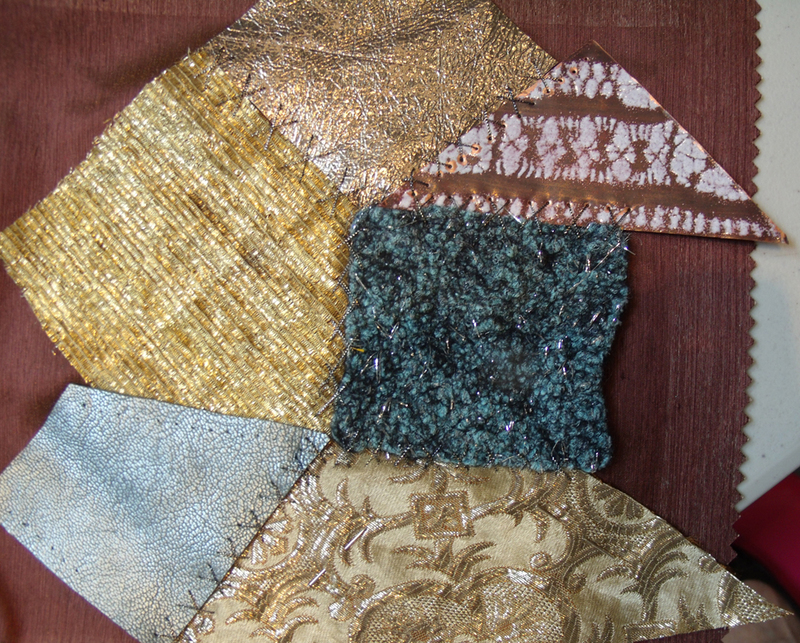 Everyone set to work choosing their 3 materials and laying them out, the strip sampler proved to be the most popular as it is the easiest to co-ordinate; odd crazy shapes take a lot longer to set up.For the task of joining two of the disparate materials together – colour, surface texture, weight of each material has to be considered as well as the selecting the technique. 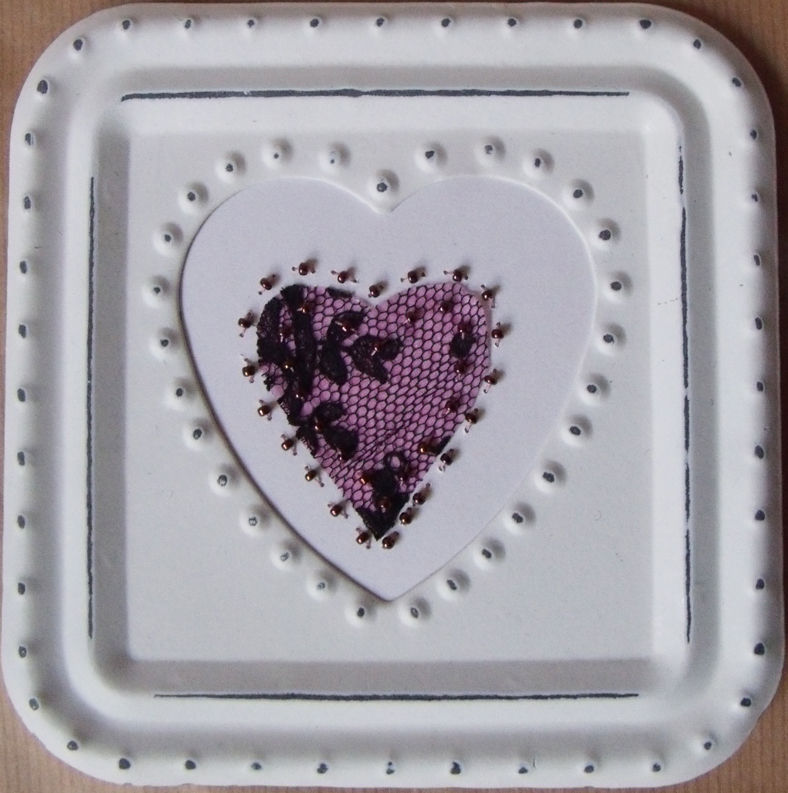 I showed everyone how to make regular holes in various surfaces, involving textile techniques – a tracing wheel, an old darning needle and a hammer! It works for me every time…..and off they went with mixed but interesting results. marking out where to make the stitching holes on copper. 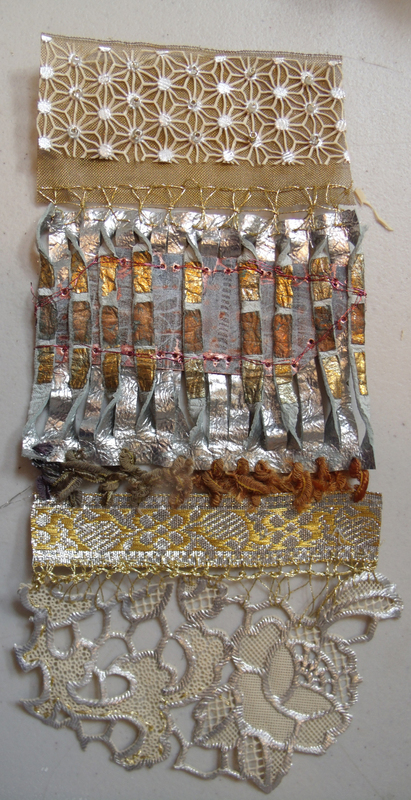 metallic leather, woven braid stitched together with silky knitting ribbon, awaiting the addition of a scrap of plastic tablecloth. 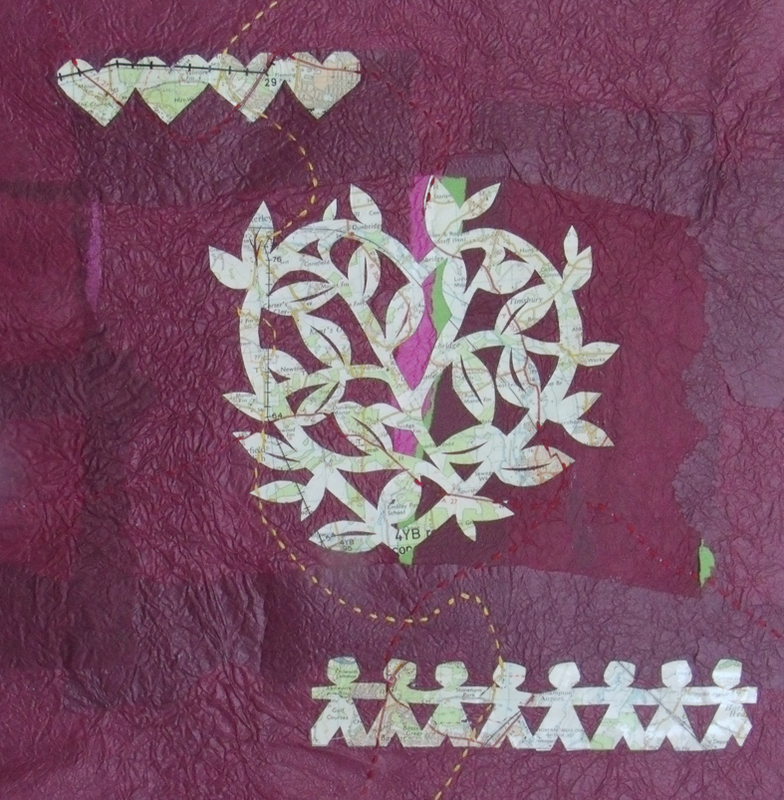 only to find that when stitched it looked very different than imagined. 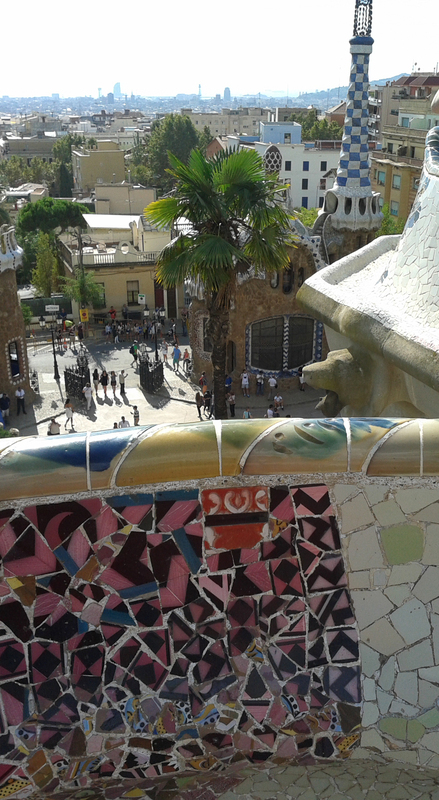 after a relaxed start the makers’ critical faculties began to kick in! 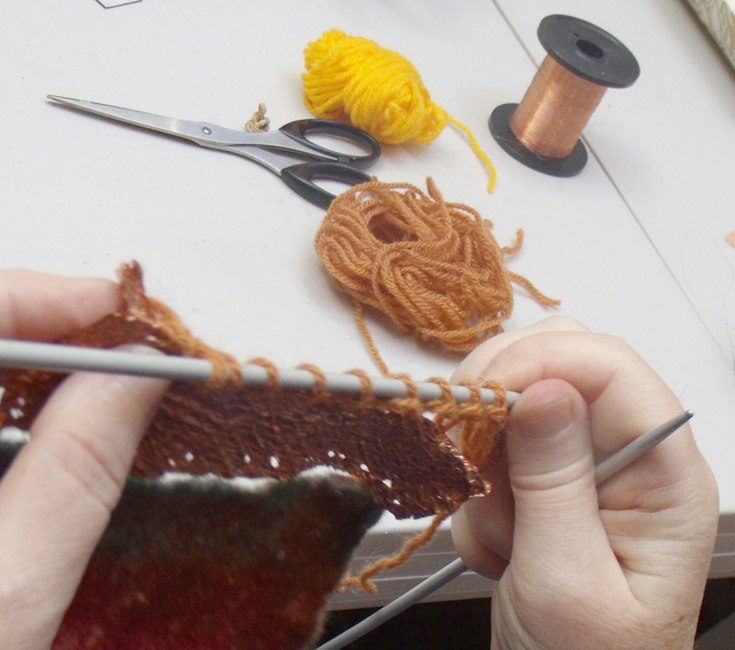 I noticed that the knitters worked completely differently from the stitchers; they immediately made a start by adding a linking system to one edge of a piece of material either using crochet or knit to form an edge ready to accept the next piece of material – this gave them much more contemplation time for what comes next – the stitchers are able to join 2 pieces together simultaneously. Why had I not appreciated this before? 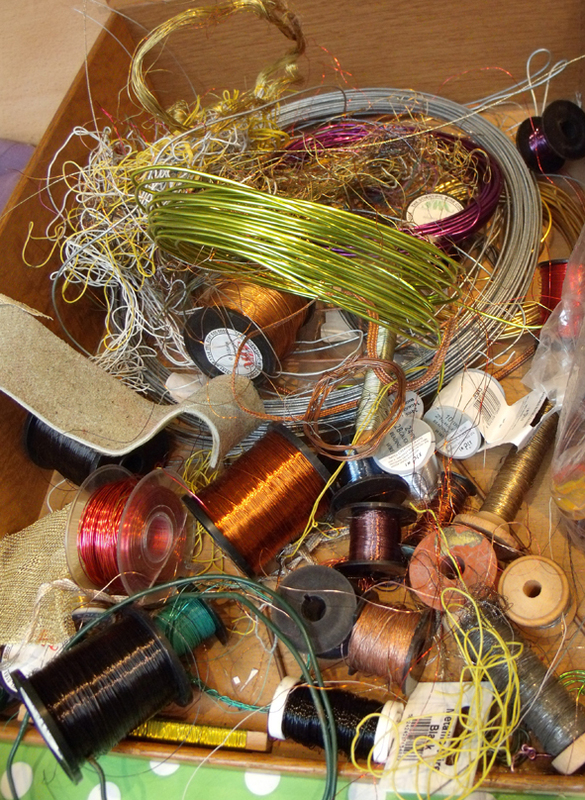 However working the wire into fine leather was a fiddly affair – see below right. Now I really must get the knitters to teach how to do this technique. 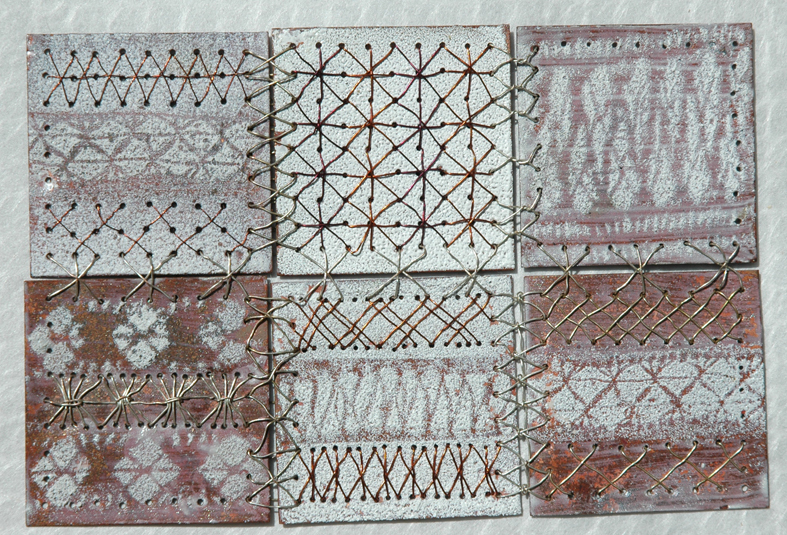 When I first attempted to join metal together using my own stitching techniques I used a different system – making rows of simple cross stitches between the strips of vitreous enamelled copper pieces, so joining each at the same time. 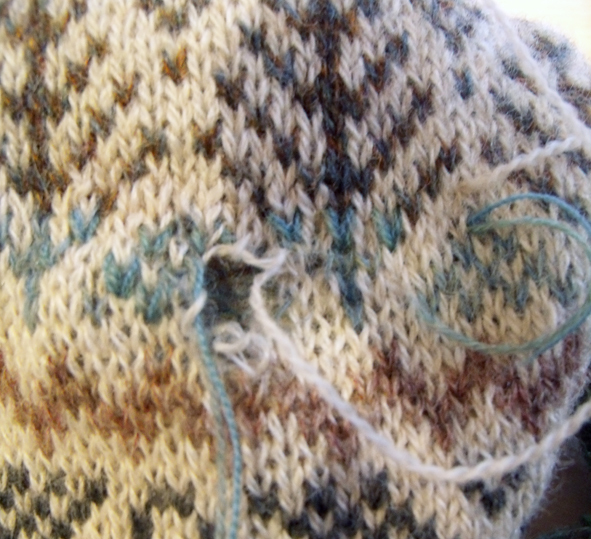 It took me some time to try the different insertion stitches. 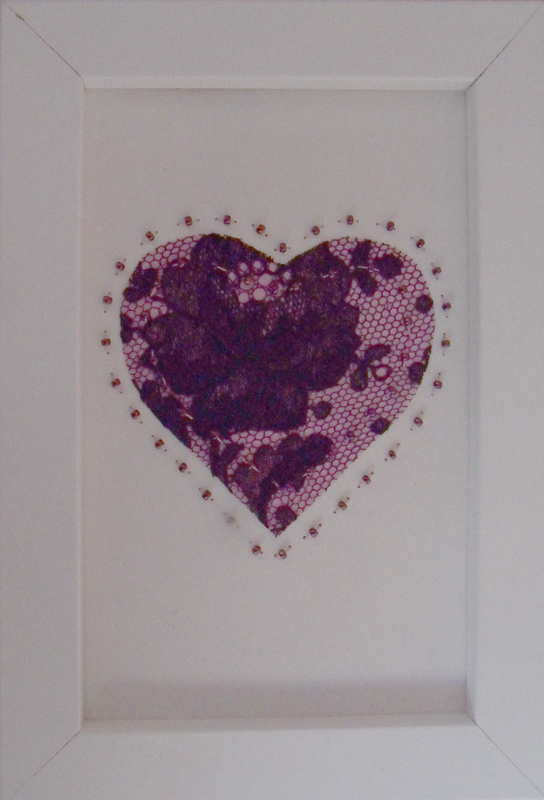 In fact it was an aversion to drilling all the holes that put me off developing this technique for a long time – but now I happily drill rows of holes for hours at a time – well not exactly ‘happily’….maybe I will get to like crochet after all. 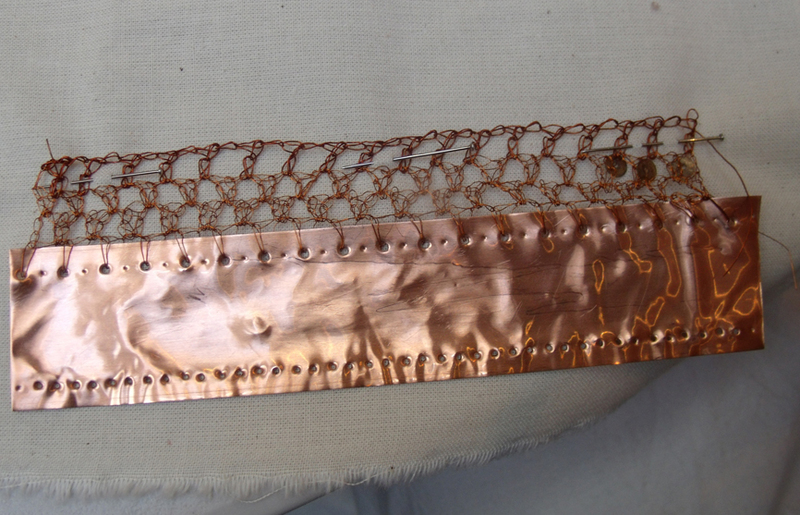 When the crochet wire was worked into some copper strips it was very successful…the strong steady base really helps achieve an even texture and the structure gives the metal wire movement and elasticity which is much more compatible to work into fabric. I showed several people how to embroider simple insertion stitches for a lace-like join…securing the fabric to a piece of card first to steady the gap between the pieces, a traditional technique found in my old embroidery manuals for white work. 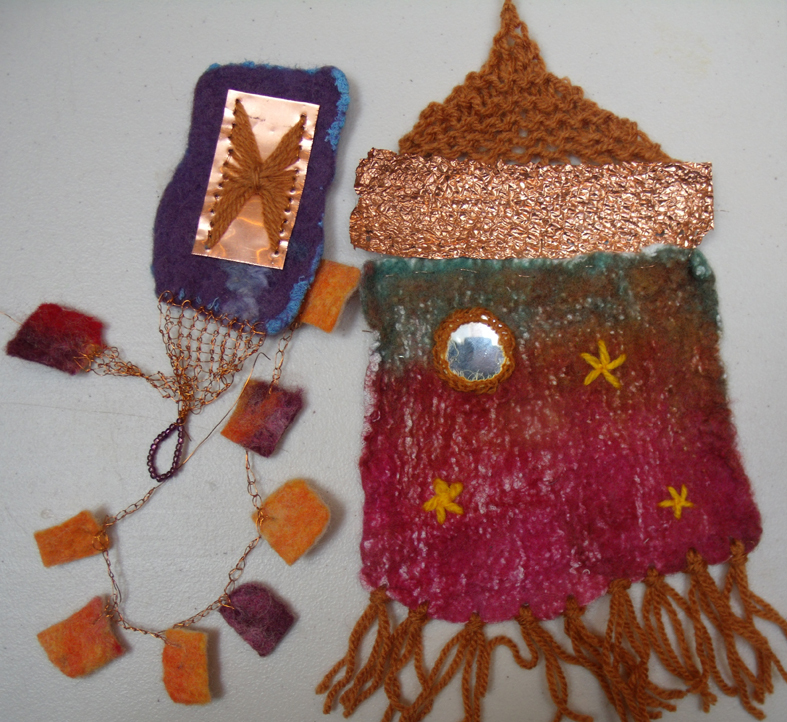 ripped card, copper foil, nuno felted silk and wool, tweed and hand embroidery all joined together in crazy style – Kirsten Hill-Nixon. 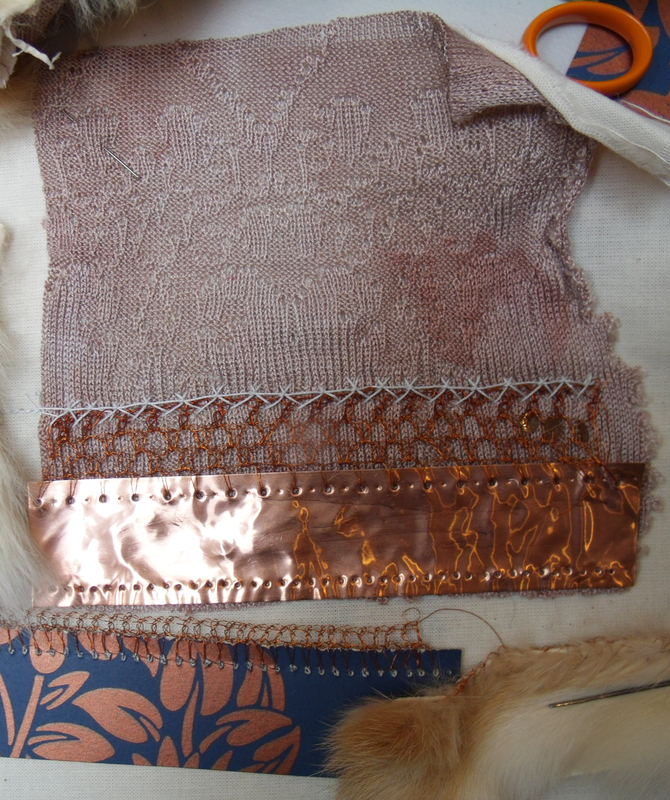 pre machine knitted lace, crocheted copper wire with copper foil and wall paper – Steph Wooster. And to prove that sampling really does inspire people here is new work from Steph – the day after the workshop she added some of the sampled techniques and materials to her range of knitted hot-water bottle-covers. 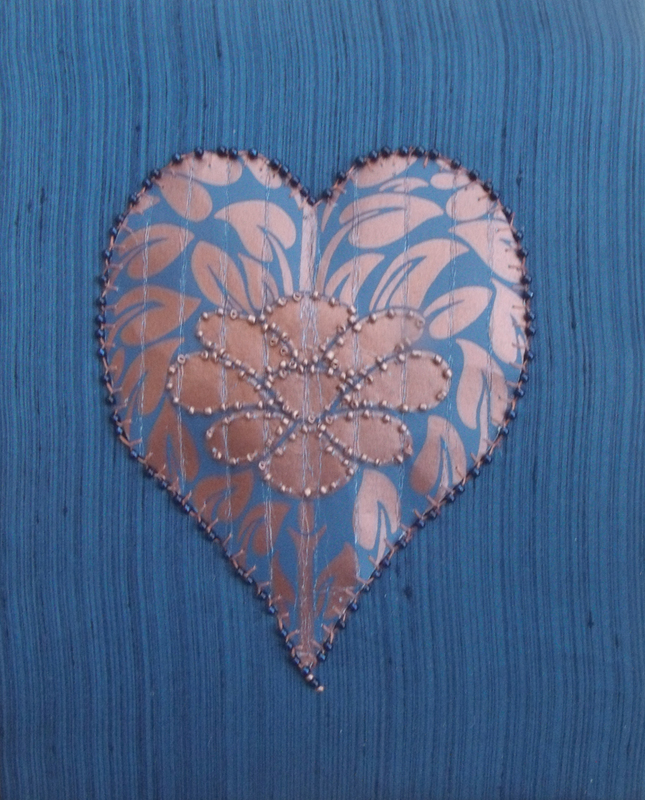 Categories: Crazy Patchwork, Heart Space Studios, Make - Do and Mend, Stitching | Tags: copper, crochet, design, knitting, leather, metallics. 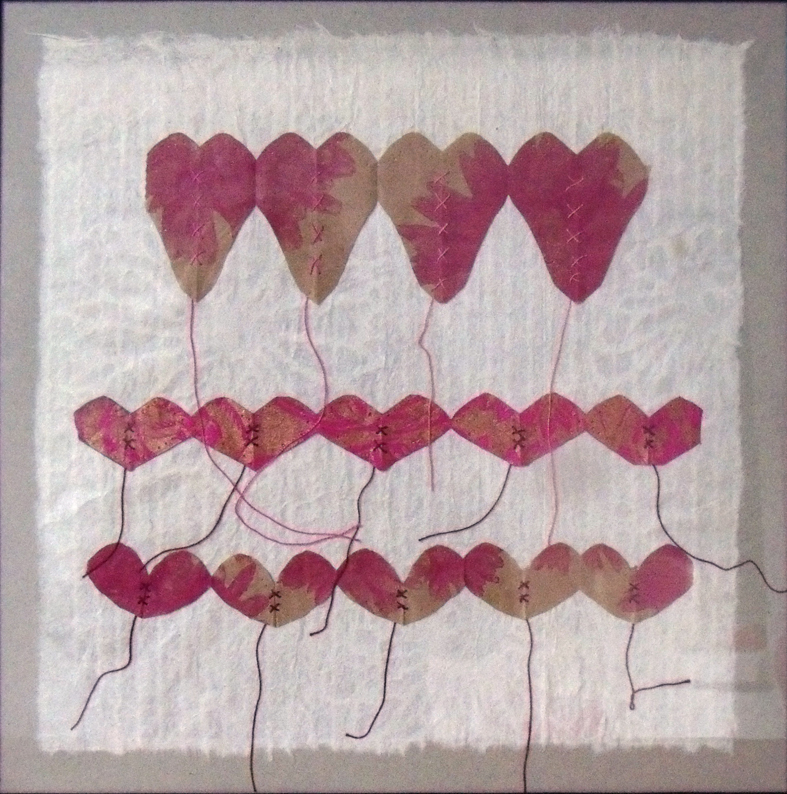 craxy patchwork, mixed media, samplers, textiles, vitreous enamel | Permalink. it does what it says on the card. 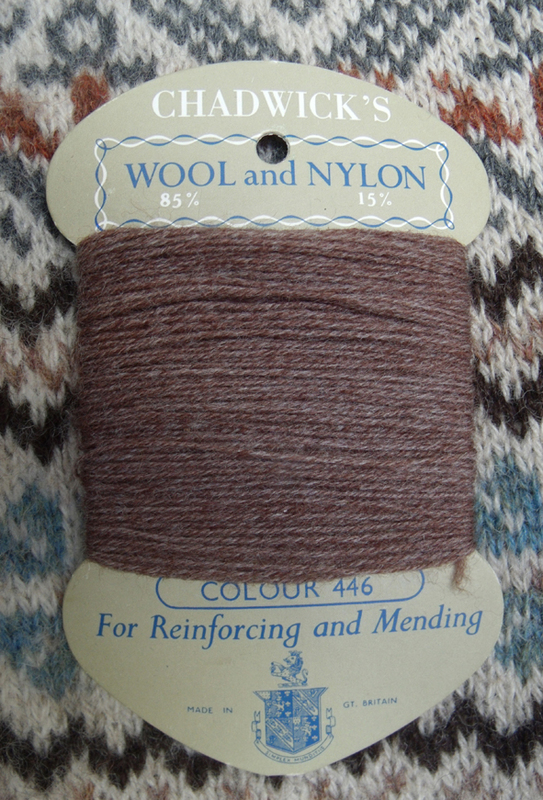 I really love vintage clothes and still wear pieces I bought 30 years ago when they were at least 30 years old at the time; keeping my old clothes alive and wearable has probably prompted my fixation with darning and mending. 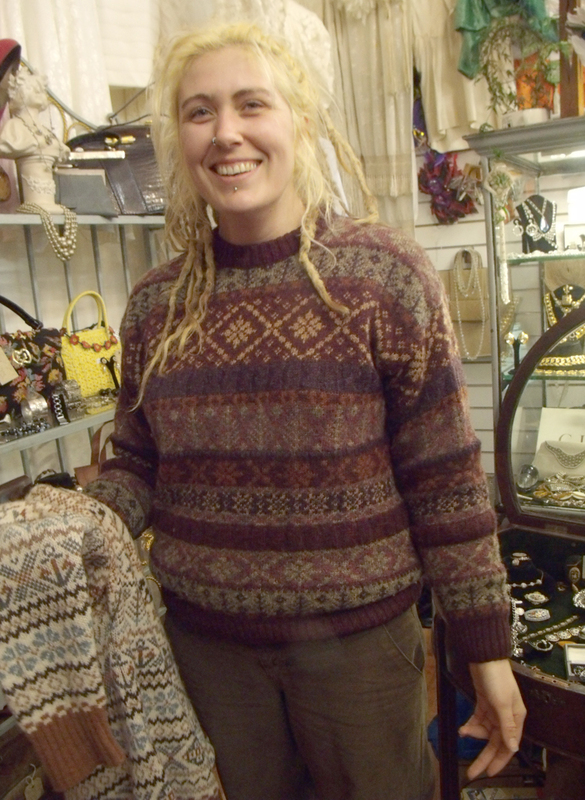 So I was very pleased recently to help Cleo Holyoak-Heatley, the owner of my favourite vintage clothes shop, Clifton Vintage Boutique, in Clifton Arcade in Bristol. I was talking to her about the current Mending Exhibition while scouring round looking for something -anything fanciable; it’s not worth going to look for something specific in a vintage clothes shop – the eyes, mind and purse have to be open to anything and everything on display, in season or out…..
rack of fair-isle knit wear. 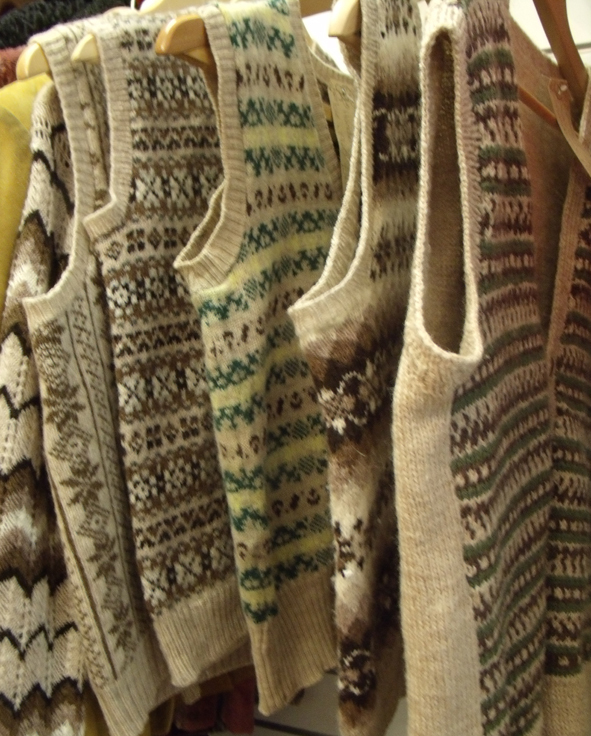 It was a freezing day and I was checking out a rack of Fair-isle sweaters and vests, when Cleo asked if I knew of anyone who could possibly mend a favourite Fair-isle sweater of hers with a hole in the elbow? 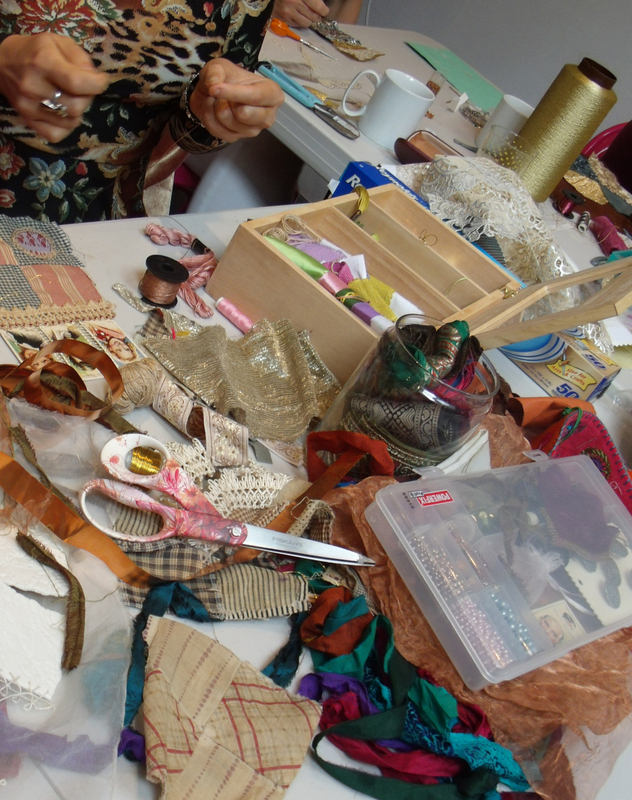 I at once volunteered – it could be a bit of a challenge but as I am currently running mending classes at Heart Space Studios, I thought I could get some practice in. 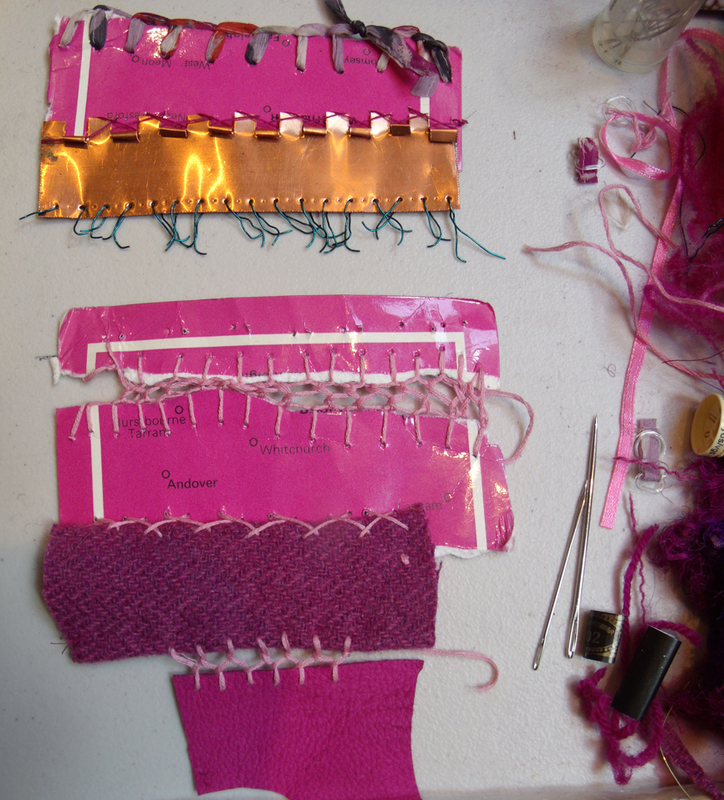 The first thing I had to do was secure the knitting form un-ravelling any further, easy enough in a small hole but needs quite a bit of reinforcement in anything bigger, I decided to try to re-knit the loops left over, but the wool was very weak and kept fraying. 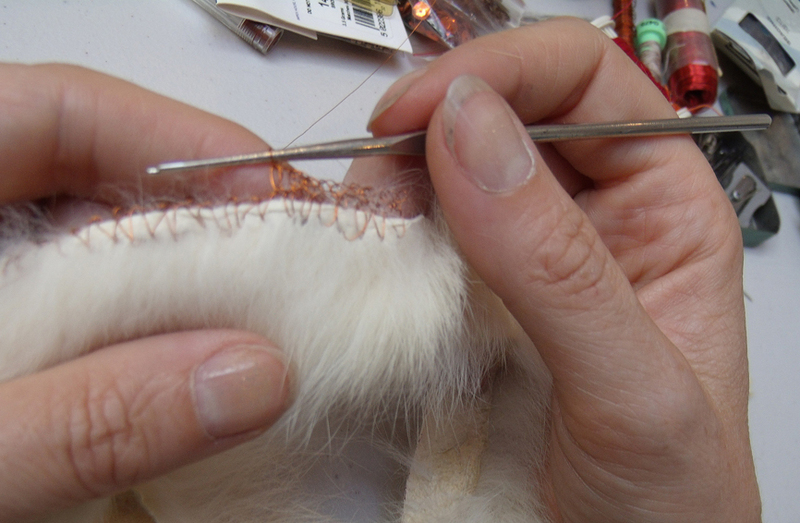 I have to say that what follows is for mending nerds only….. but if you want to see the finished result just go to the end of the post. 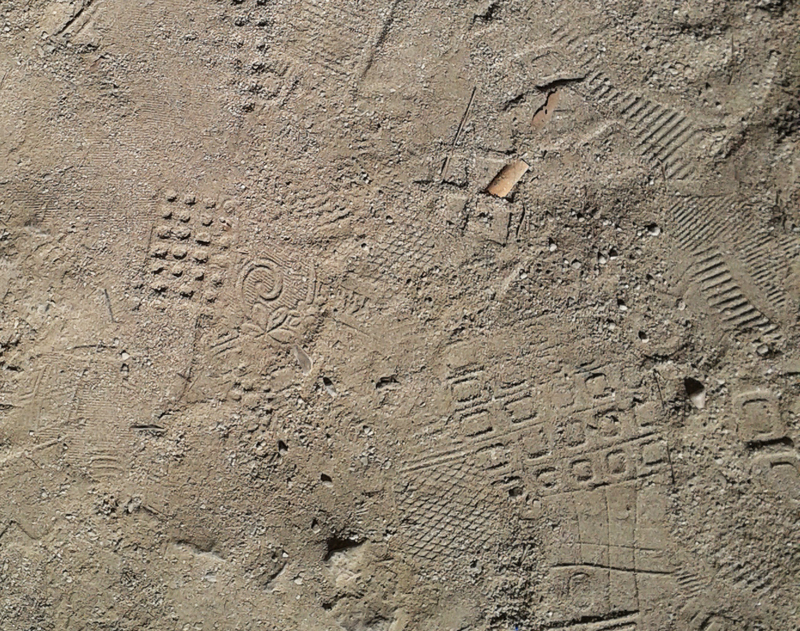 The problem with any patterns, knitted or not, is that several colours have to be used to make an imperceptible mend , and here the damage extended through 2 colours, the pattern and the ground colours. 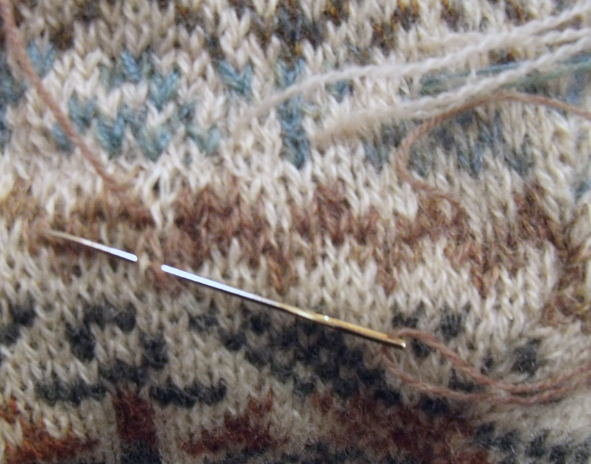 so threading up 2 needle with the colours on each row, I started a few cms. 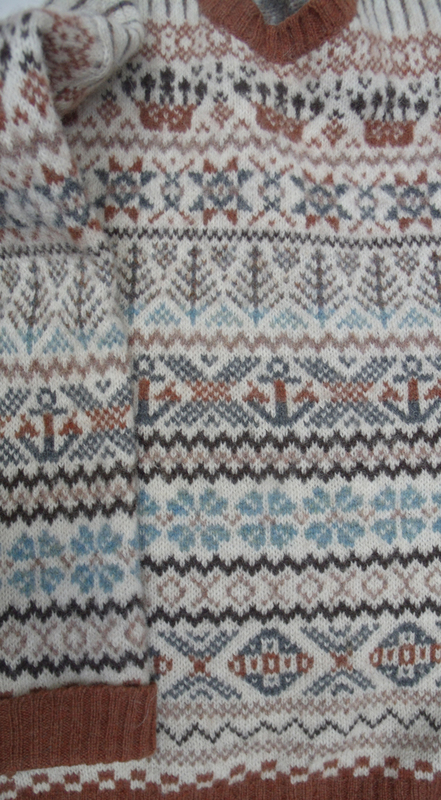 away for the hole and using a type of French Darning , which is covering the knitting stitches along the row in a zig -zag pattern, this covers the hole and reinforces the surrounding fabric. 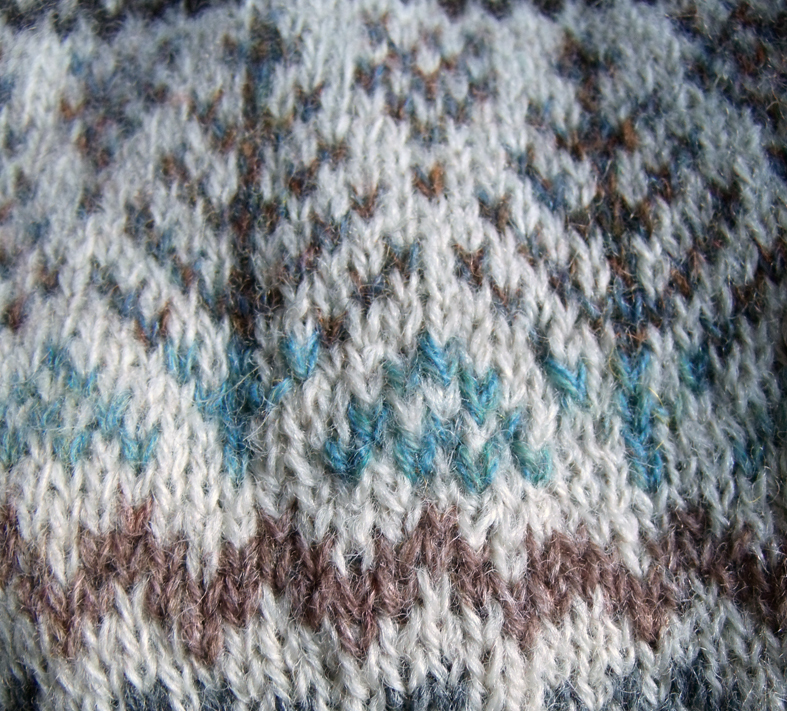 Cleo, in even more intricate Fair – Isle.